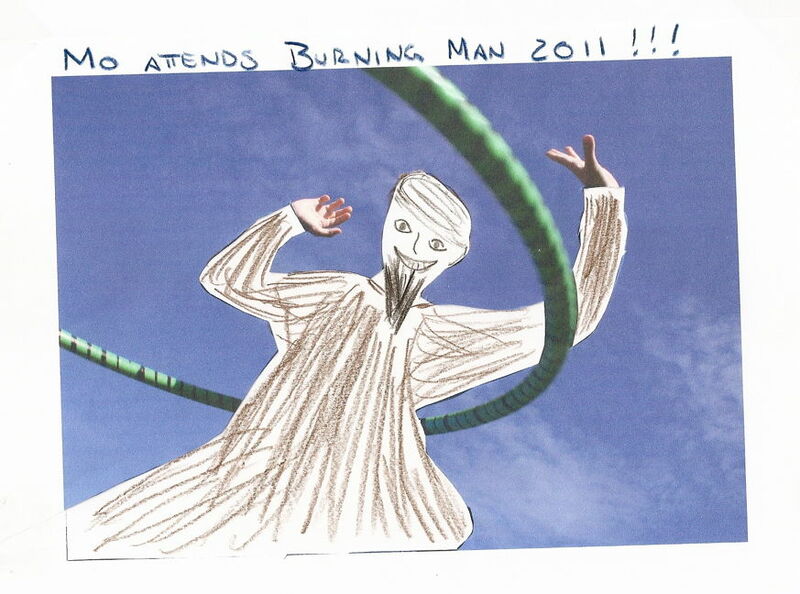 This section of the Mohammed Image Archive is about the various competitions, contests, art exhibitions and "Draw Mohammed" days and celebrations that have occurred around the world since 2006. 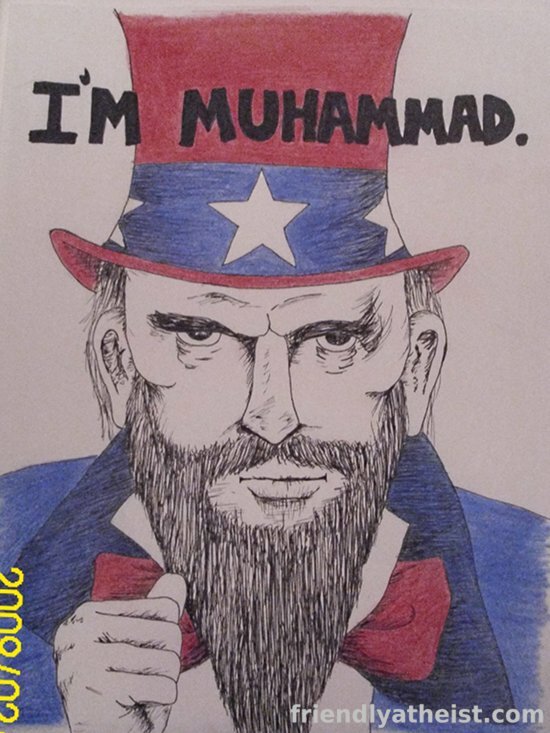 The most famous among these is "Everybody Draw Mohammed Day," which first happened on May 20, 2010, and which in the following years has continued informally as an annual event every May 20. 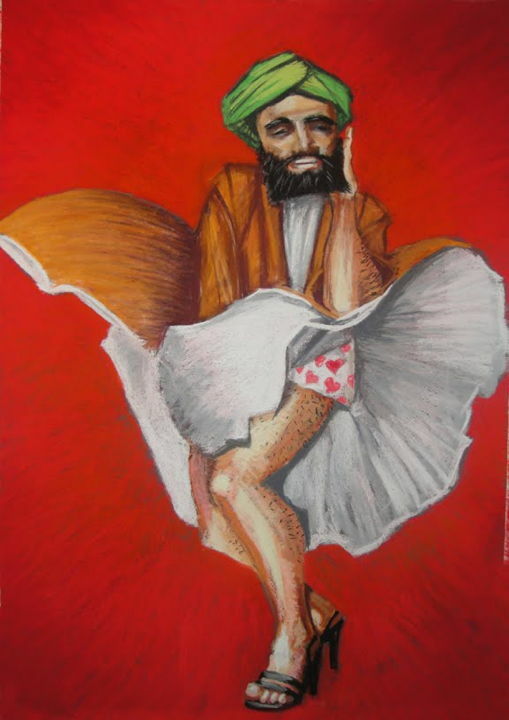 Also well-known is the "First Annual Muhammad Art Exhibit and Contest" which took place in Garland, Texas on May 3, 2015 and which was the target of an attempted terror attack. 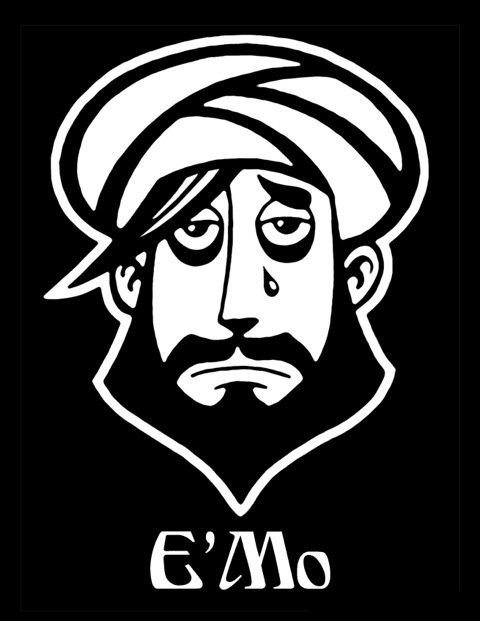 Less famous are events such as an impromptu Mohammed cartoon-drawing game put on by members of the Danish People's Party in August of 2006 and which caused a minor scandal in Denmark when a secret videotape of the contest was posted online. All of these events and contests, as well as others, are covered in this section of the Mohammed Image Archive, along with many sample submissions and exhibits -- although the sheer volume of entrants (thousands of people have participated in Everybody Draw Mohammed Day over the years, for example) prevents this page from containing a thoroughly comprehensive collection of every single drawing ever made of Mohammed in every event. 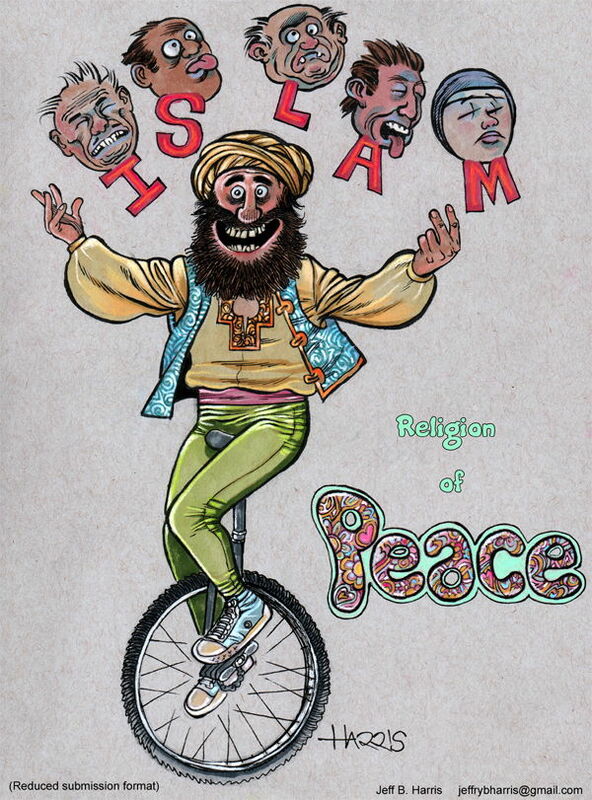 On April 20th, 2010, a Seattle-based cartoonist named Molly Norris drew a cartoon advertising a make-believe holiday called "Everybody Draw Mohammed Day! ", to be observed exactly one month later on May 20, 2010. She created the cartoon to protest the decision by the Comedy Central televsion network to censor any images of Mohammed in episodes "200" and "201" of the animated show South Park (see The Mohammed Image Archive's Television, Film and Video section for the full details of these episodes). 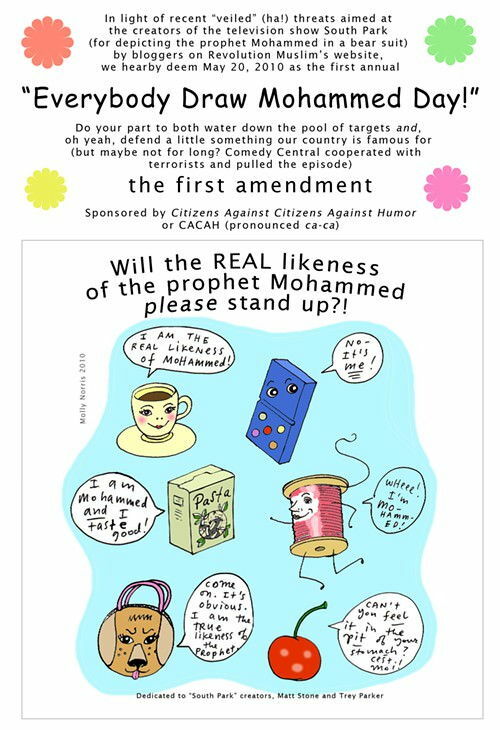 Sponsored by Citizens Against Citizens Against Humor or CACAH (pronounced ca-ca)"
Will the REAL likeness of the prophet Mohammed please stand up?! [Teacup]: "I am the real likeness of Mohammed!" [Domino]: "No -- it's me!" [Spool of thread]: "Wheee! 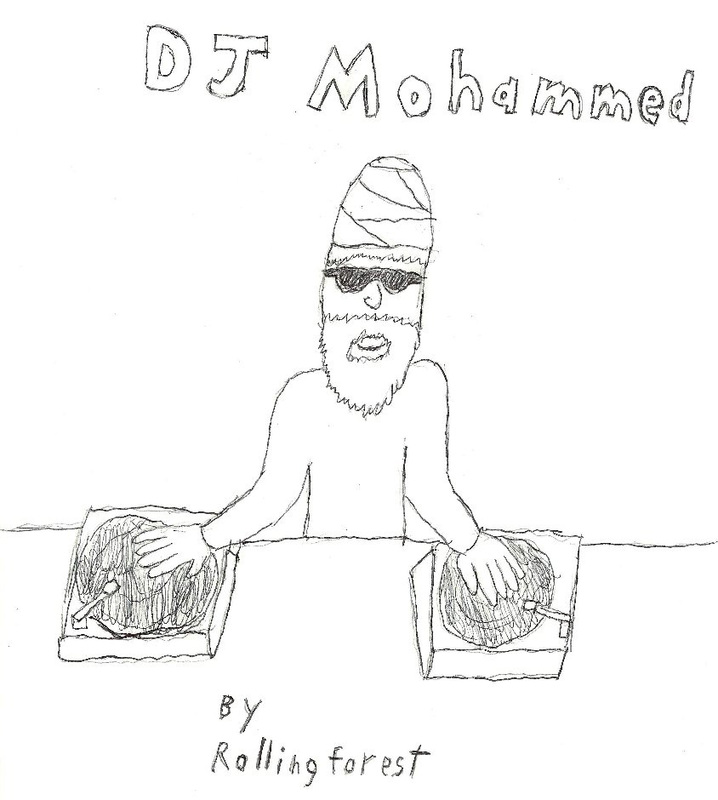 I'm Mohammed!" [Cherry]: "Can't you feel it in the pit of your stomach? 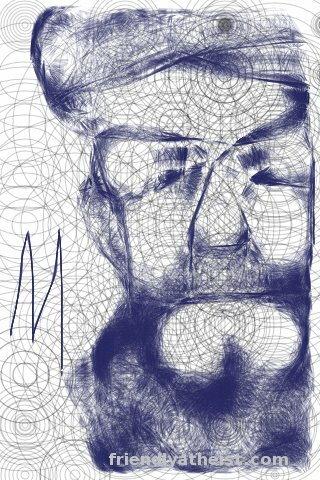 C'est moi!" [Purse with dog face]: "Come on. It's obvious. I am the true likeness of the Prophet." 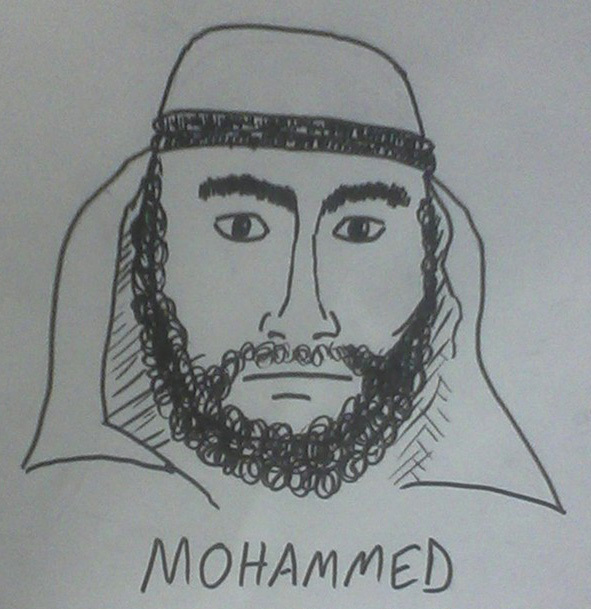 [Box of pasta]: "I am Mohammed and I taste good!" Since Norris herself did not have a particularly large online presence, the cartoon drew little attention for the first day or two, so she sent it to various bloggers and columnists in the Seattle area in the hope that they would publicize the idea. The first high-traffic site to mention the cartoon was the "Savage Love" column in the Seattle weekly newspaper The Stranger on April 23, which created a lot of buzz and quickly led to radio interviews for Norris in Seattle. 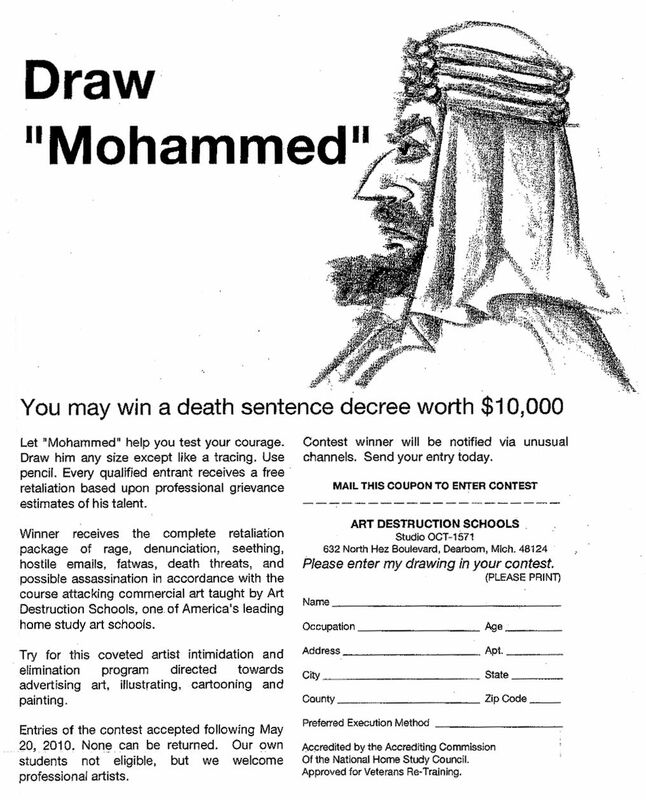 In these early interviews, Norris clearly stated that she was serious about the "Everybody Draw Mohammed Day" idea and hoped as many people as possible would participate; when asked, "Are you sure you want to do this? ", she replied "Yeah, I want to water down the targets...as a cartoonist I just felt so much passion about what had happened, I wanted to counter Comedy Central's message about feeling afraid....it's a cartoonist's job to be non-PC." 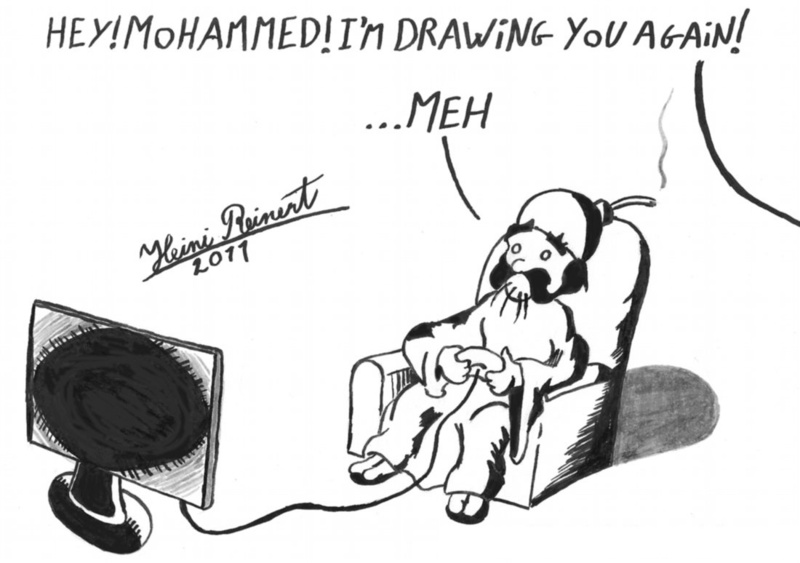 On April 25, 2010, the story went viral and spread nationwide, and almost immediately millions of Internet users started discussing Everybody Draw Mohammed Day as if it was an actual holiday. 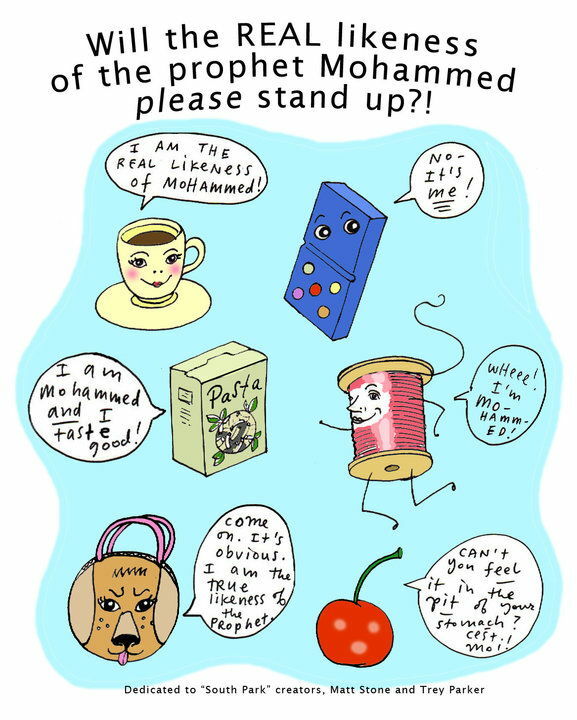 It was only at this point that Molly Norris suddenly started backtracking, claiming that she never intended for Everybody Draw Mohammed Day to be a "real thing," that it was just an off-the-cuff cartoon joke, and not an actual call to action. 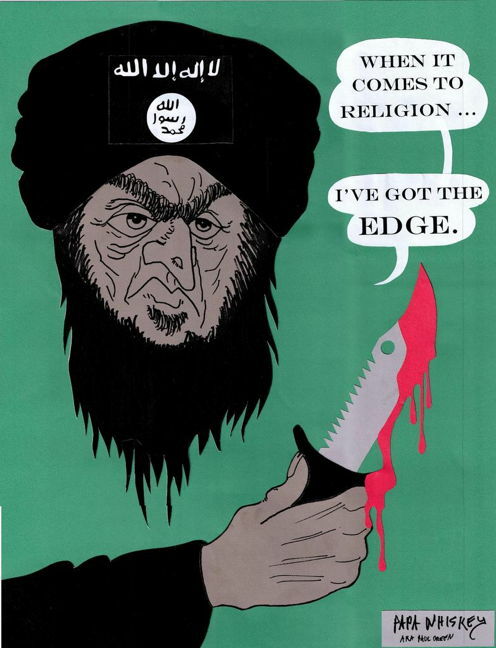 Her abrupt reversal was caused by two things: First, despite Norris' plan to "water down the targets" by having so many people create so many Mohammed portraits that the terrorists would get overwhelmed and not know how to respond, Muslim extremists instead zeroed in on her specifically as the individual behind the movement, and began issuing death threats to her personally. Less discussed was the second reason for her reversal, which was that Norris had accidentally stumbled onto an issue which was already a big deal among conservatives, and that she -- self-identifying as a "progressive" -- was unaware of this, and was mortified to see that almost everyone who embraced Everybody Draw Mohammed Day was either a conservative or a libertarian, people she considered her political enemies -- while her purported allies on the left viciously criticized her for unwittingly taking up a conservative cause (freedom of speech). Norris's original gut reaction to Comedy Central's censorship of Mohammed depictions was the natural gut reaction of most Americans -- outrage -- yet she was too naive to realize that her fellow "progressives" had long ago flipped sides on this issue, and were now in favor of censorship of "hate speech." Upon learning all of this, Norris quickly began denying her earlier statements, saying she "didn't mean it" and distancing herself from Everybody Draw Mohammed Day, so as to maintain her status as a good progressive. 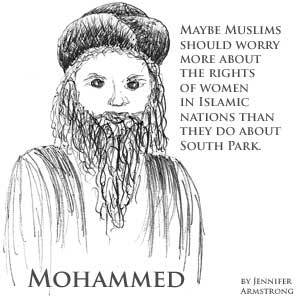 For these reasons -- but mostly out of fear for her life due to death threats from Muslims -- Norris disavowed Everybody Draw Mohammed Day before May 20 even happened, and began profusely apologizing to Muslims, naively thinking that groveling would get her off the hit list. But the threats against her remained. She then stopped posting online, and eventually (with the help of the FBI, which had gotten involved) "went into hiding," changed her name, and disappeared from public view. She remains in hiding to this day, and will almost certainly never return to the public eye, since she now has a different name and has even gone incommunicado with her own family. 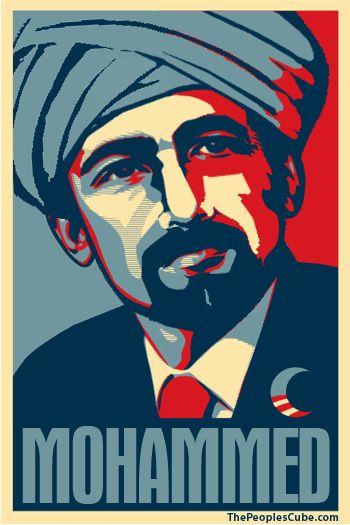 Despite Norris' disavowal and disappearance, the fire had been ignited and various Web sites and Facebook pages -- almost all of which were either libertarian or conservative in outlook -- took up the banner for Everybody Draw Mohammed Day, and hosted their own unofficial contests or exhibitions of submitted Mohammed portraits. 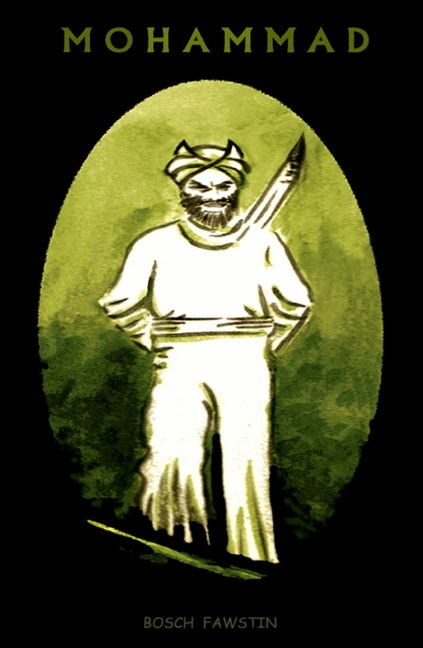 There never was any "official" central organizational focal point for Everybody Draw Mohammed Day (which eventually lost the exclamation mark in its original name); the concept became more of a "crowd-sourced" popular uprising in which anyone and everyone could host their own "celebrations." 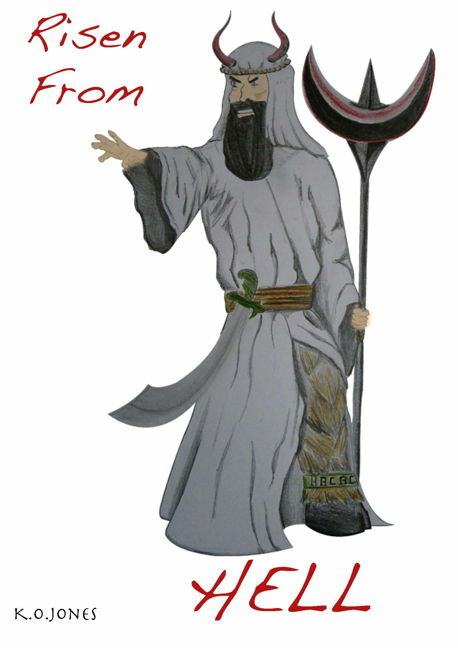 To that end, the following Web sites announced their own Everybody Draw Mohammed Day contests in 2010, accepting submissions from anyone who wanted to participate, and/or collecting various images posted elsewhere online, with some sites then declaring their own "winners." This selection of unofficial celebrations on May 20, 2010 is by no means exhaustive, but instead merely covers some of the more well-publicized contests. Due to the transitory nature of blogs and independent Web sites, many of the lesser-known posts made on May 20, 2010 have since vanished, as the blogs or pages have been abandoned in the interim. 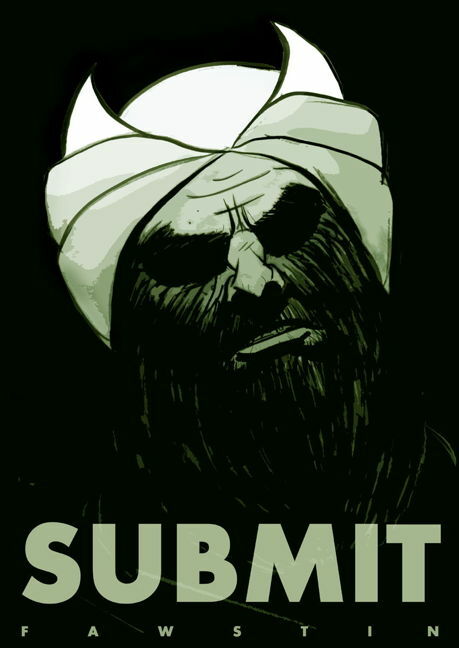 The libertarian magazine Reason was one of the earliest sites to publicize Everybody Draw Mohammed Day, at first announcing on April 23, 2010 that they were asking for Mohammed submissions, then on May 18 posting a long essay explaining their rationale for participating in the event, and finally on May 20 announcing the winner and the two runners-up. 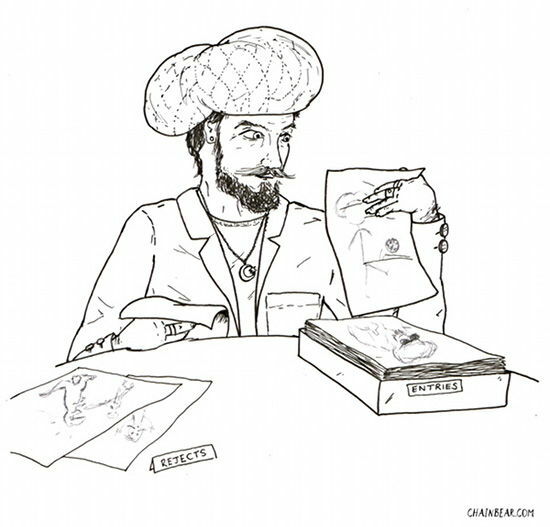 The winner of Reason's Everybody Draw Mohammed Day contest was a connect-the-dots portrait of Mohammed, chosen because it "forces the viewer to actively ... construct the image itself." 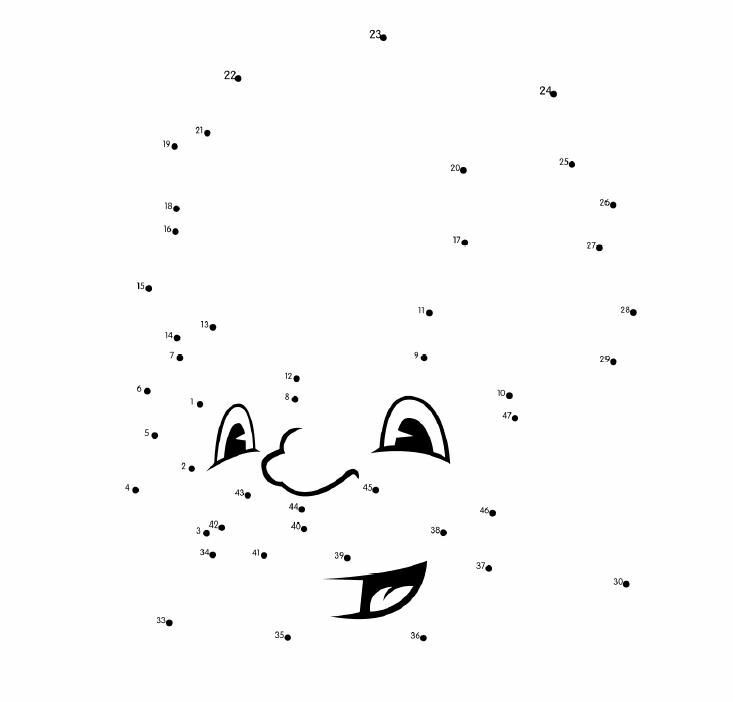 Unfortunately, as seen here, the Reason editors accidentally cropped off the bottom of the original connect-the-dots image, so that the two dots that enclosed Mohammed's beard were missing. 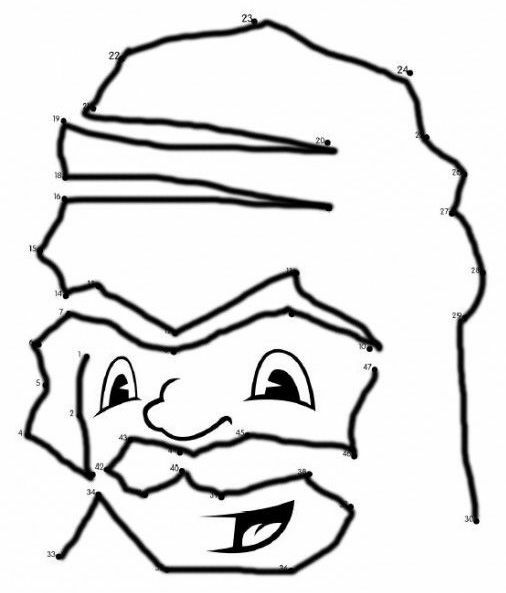 Years afterward, the site Inquisitr posted a completed version of the cropped connect-the-dots Mohammed, as well as a completed version with the original missing two dots restored, for the first time revealing what the winning submission of the Reason contest was actually supposed to look like. The two runners-up in the Reason contest were both parodies -- one of René Magritte, and the other of the "Where's Waldo?" children's books. Reason provided these captions for them: "The homage to René Magritte below states 'This is not a pipe. 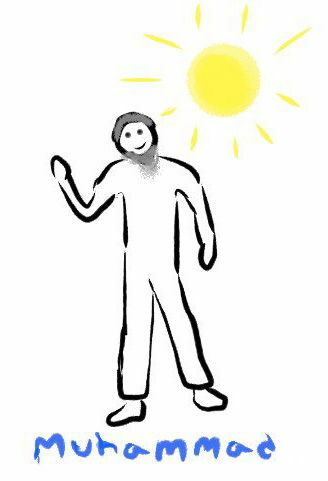 This is Muhammed,' playing with the surrealist's famous statement about the necessary disjuncture between a picture and the thing it seeks to represent. 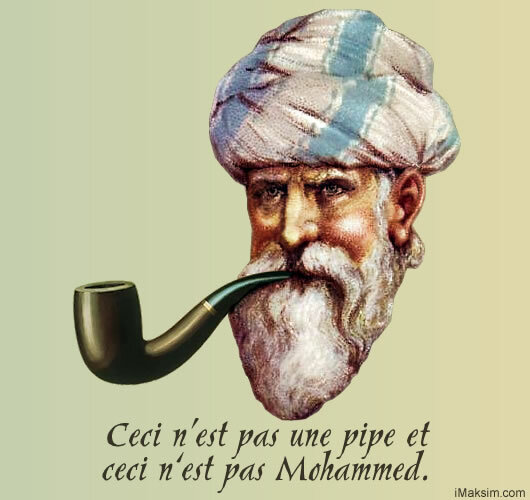 Just as the drawing is not a pipe (it's a drawing of a pipe), it cannot be Mohammed even as it insists it is. 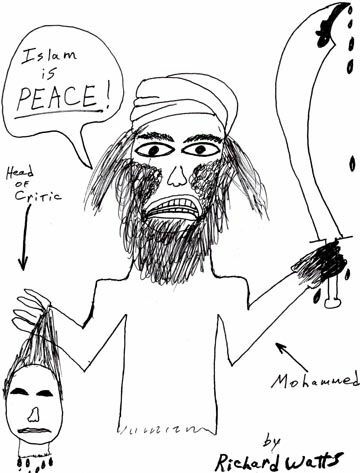 Even more, it is plainly not even a drawing of Mohammed or of any human figure. 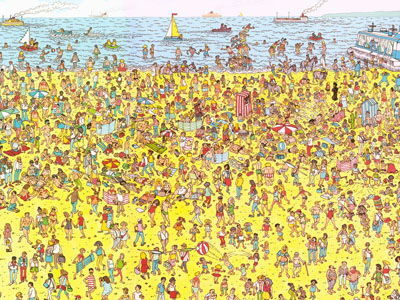 Similarly, the invocation of the popular 'Where's Waldo?' 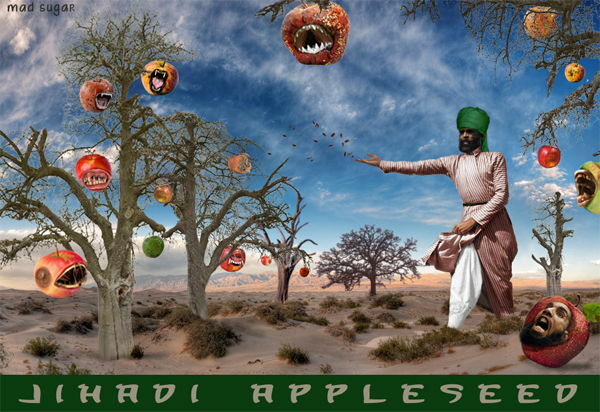 series forces the viewer to ask Where's Mohammed?, and to begin a hunt for a figure in the midst of an overstuffed scene. 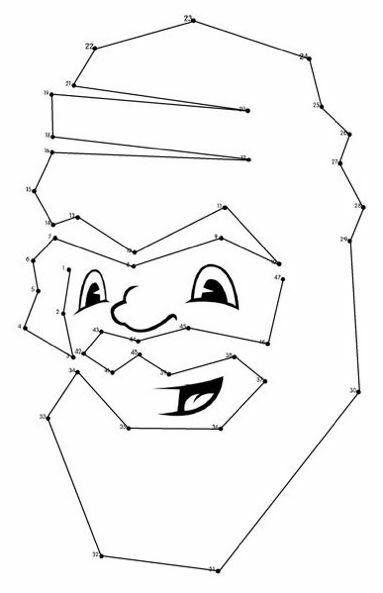 One assumes the black-robed character in the upper right-hand quadrant of the image is our quarry, but then what does it mean to confer on a small dot any significance whatsoever?" As far as can be determined, Reason never posted any of the other also-ran submissions from their contest -- only the three "winners." 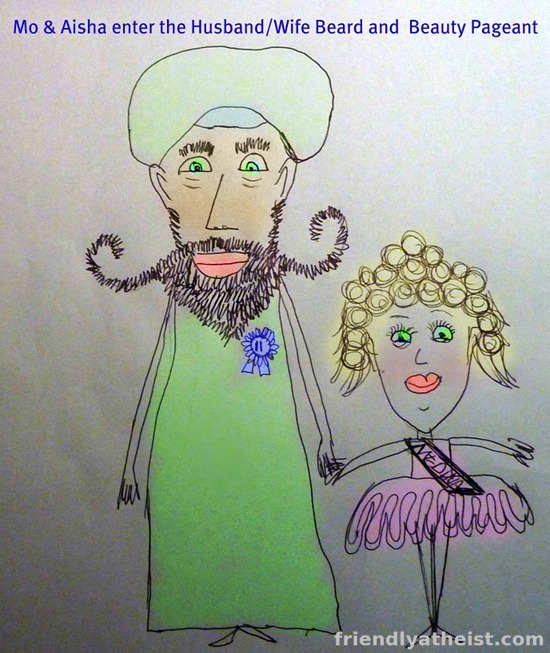 The first Everybody Draw Mohammed Day was also noted and promoted by yours truly in essays posted at PJMedia and zomblog, where the image above was submitted by an artist named Tad Pole, and which was unoffically declared the "winner" of the Mohammed-drawing "contest." (Click on the image to see a full-scale high-resolution version of it, suitable for framing.) "Tad Pole"'s original caption for his work was, "Mohammed splits the moon while riding his steed Buraq with his child-wife Aisha, the heads and cartooning hands of infidels littering his path." 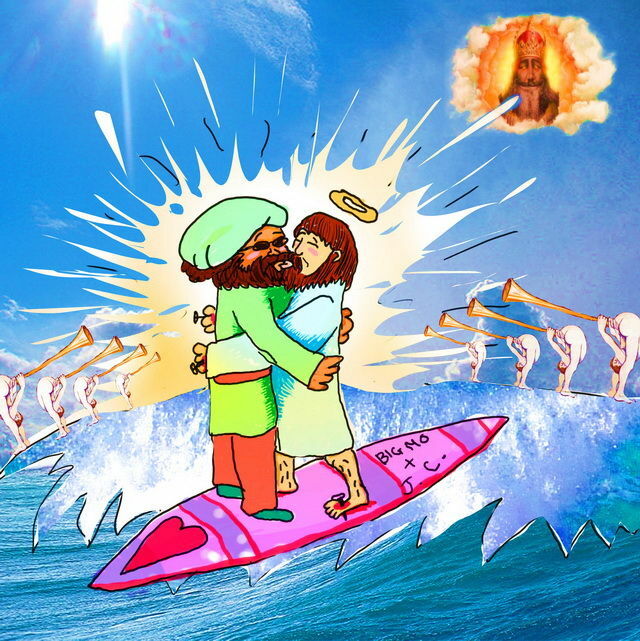 Mohammed and Jesus kiss on a surfboard, as angels blow trumpets. A parody of the Garbage Patch Kids collectable cards. 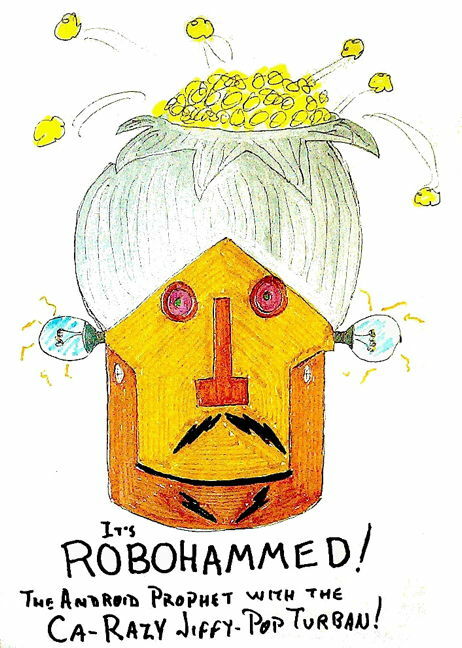 A robotic Mohammed with a turban fashioned from a Jiffy-Pop popcorn-maker. 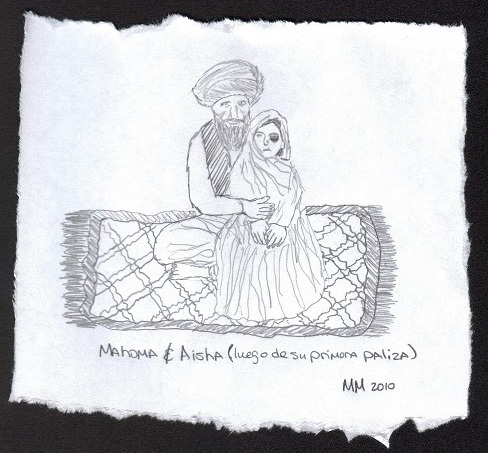 The "Friendly Atheist" blog on the religion site Patheos.com assembled a compilation of Everybody Draw Mohammed portraits which had originally appeared on a wide variety of smaller independent blogs, creating a gallery where dozens of otherwise scattered drawings could be viewed all in one place. 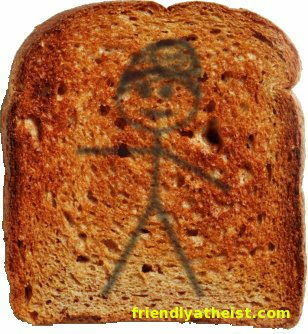 In the intervening years, almost all of the indendent blogs from which the drawings had been sourced went offline, so the Friendly Atheist compiliation ended up preserving them for posterity. 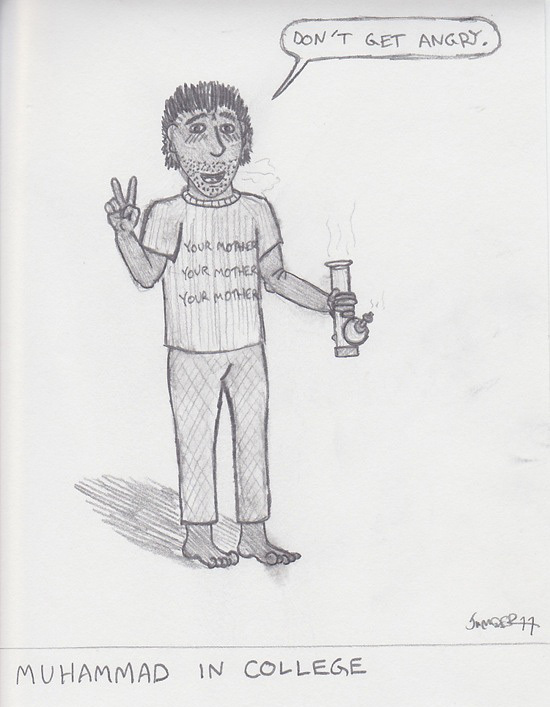 A selection of the artworks in the Friendly Atheist compilation are presented below, focusing on those that were original drawings, and not (as many of the others were) either stick figures or deriviative works. 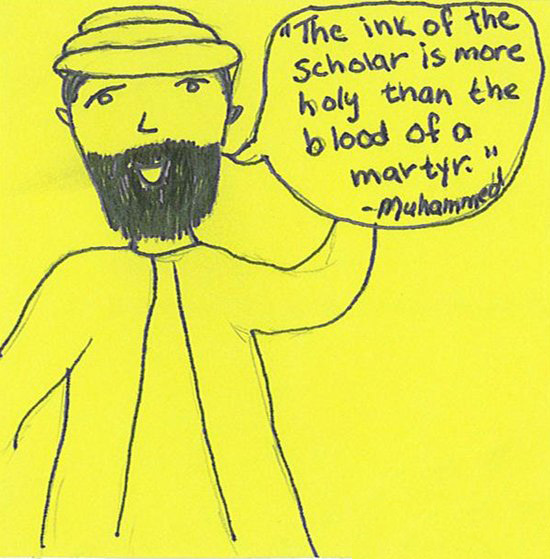 To see the full array of Mohammed portraits in the compilation, visit the Friendly Atheist post here. The selections below are presented without captions. "Carl H.L." 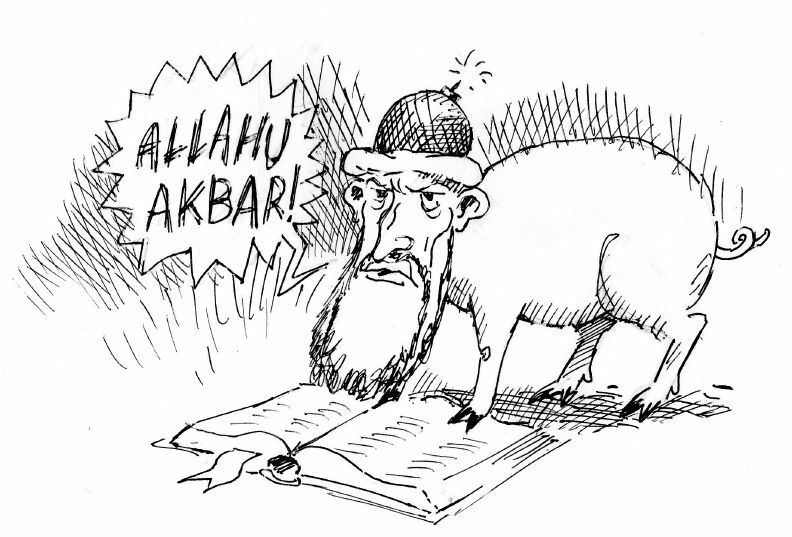 drew Mohammed as a pig in the style of Lars Vilks, but with a Kurt Westergaard-style bomb-head. "K.O. 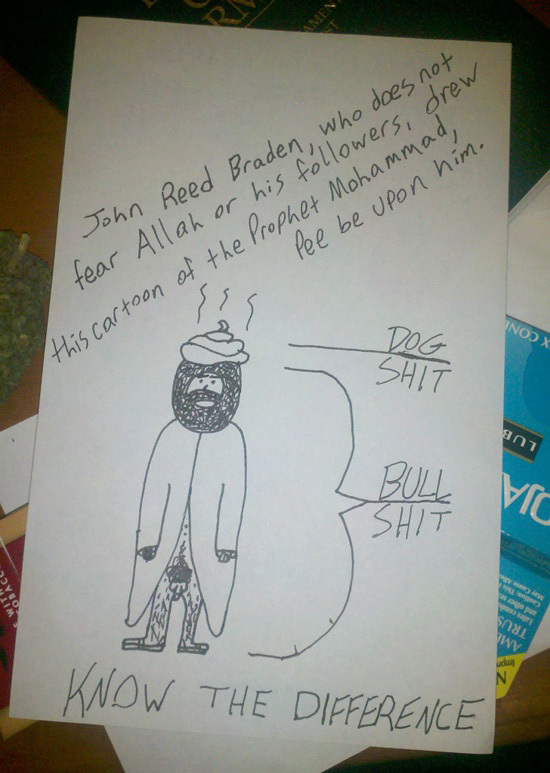 Jones" imagined Mohammed as the devil; notice his goat foot marked "Halal." 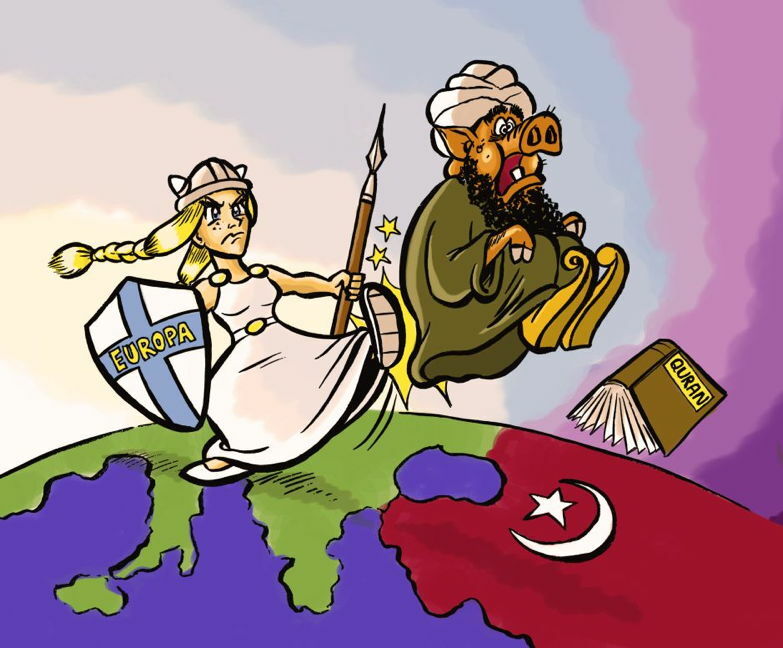 This cartoon, which shows an allegorical Europa kicking an allegorical Islam (represented as a pig-Mohammed) out of Europe may have been created years earlier during the anti-Islamisation political uprising in Europe around 2006, and only later submitted to Everybody Draw Mohammed Day in 2010; the artist is unknown. 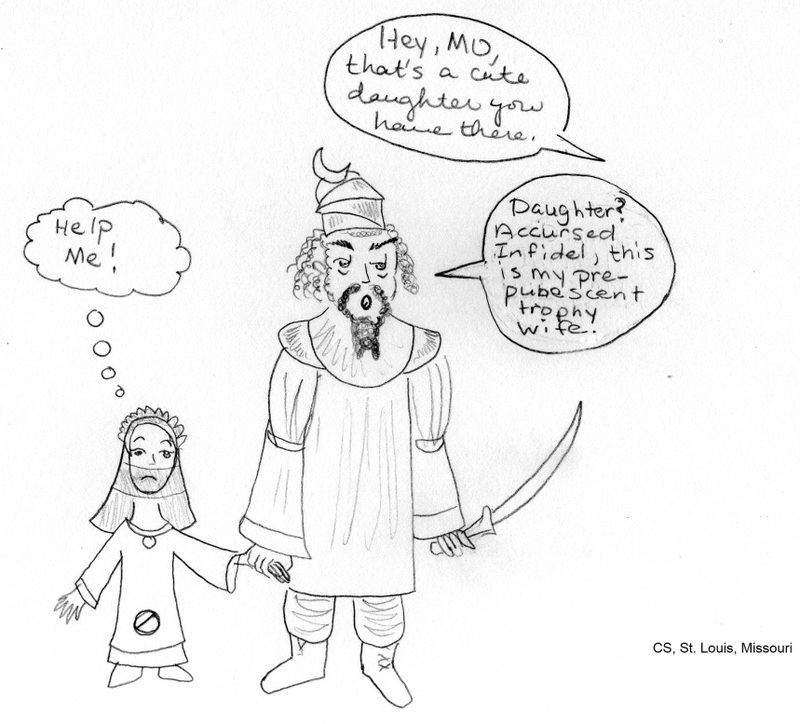 This cartoon, by "Jacques de Molay," shows Aisha as Pippi Longstocking, "the youngest bride in the world," along with an elderly Mohammed. 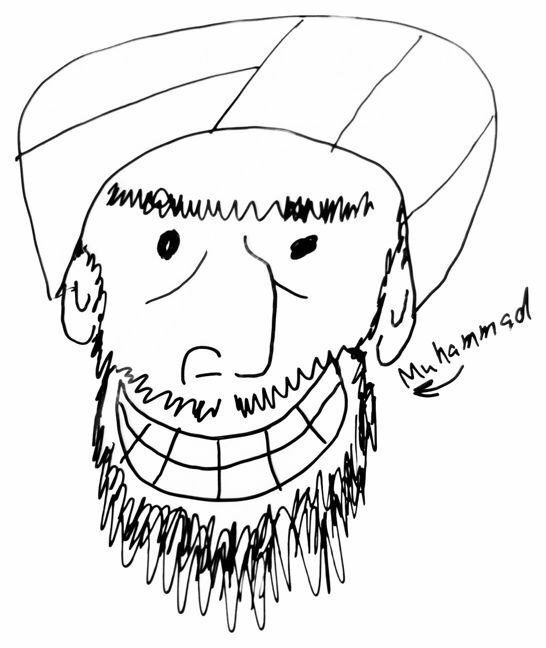 The Wikipedia page for Everybody Draw Mohammed Day features a small selection of Mohammed portrait examples. 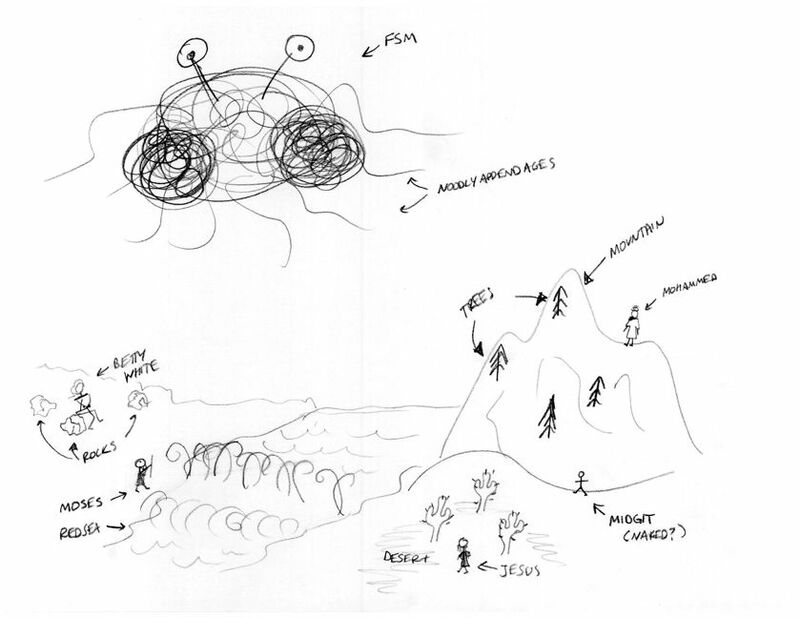 All of them (except for the rudimentary stick figures) are reproduced below, along with links to the original sources. 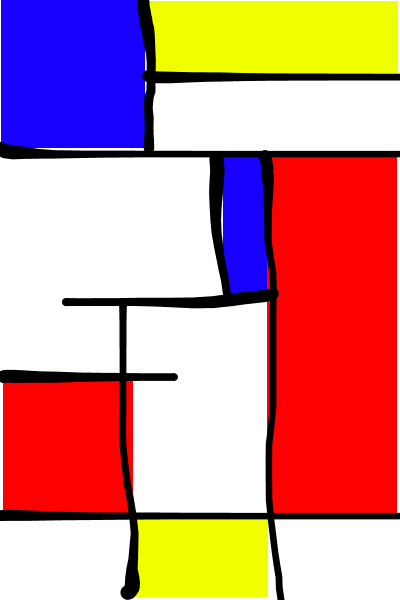 "Mohammed (in the style of Mondriaan)" -- yet another variant on the Surrealist/Dadaist observation that anything could be said to represent Mohammed (see many more examples on the Archive's "This Is Mohammed" page) -- was "posted to Flickr on Everybody Draw Mohammed Day by user "William." 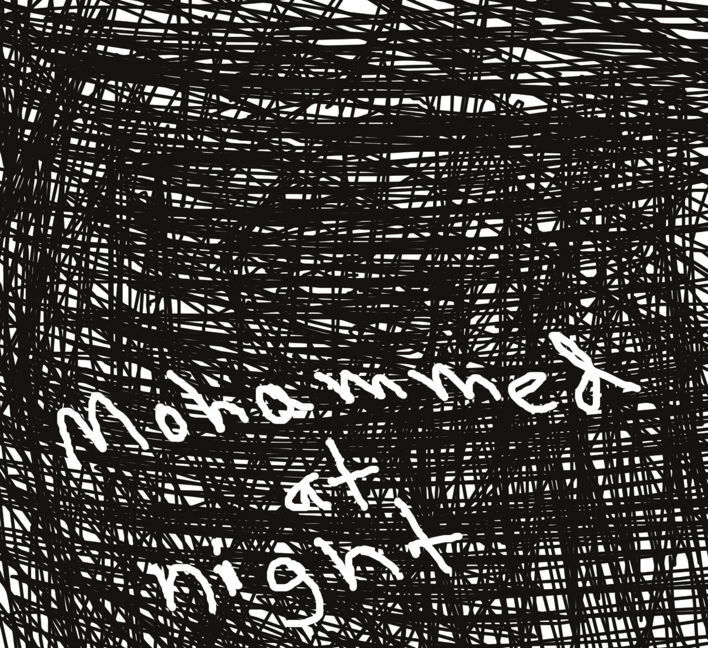 "Mohammed at Night" was also originally posted to Flickr, by "chris cosco," but is no longer visible there, and now only survives at Wikipedia. A user named "Jason," a.k.a. 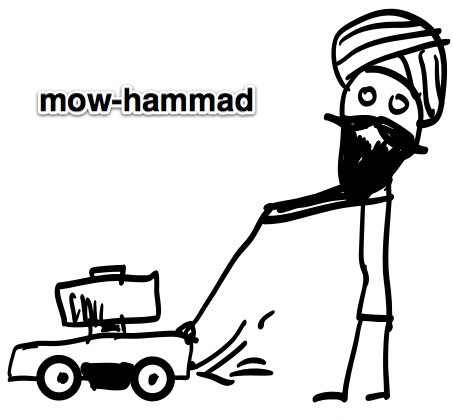 "Napalm Filled Tires," noted Everybody Draw Mohammed Day by posting not merely a Mohammed sketch but by actually uploading a video of him in the process of creating the finished product. 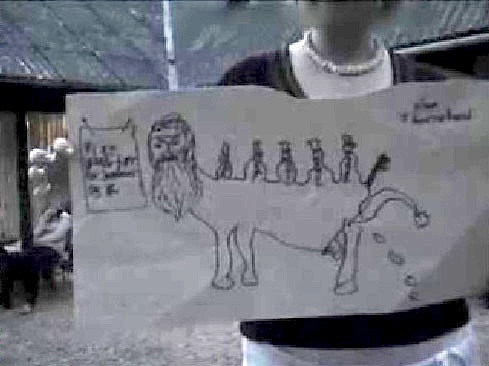 The final completed drawing is shown here. 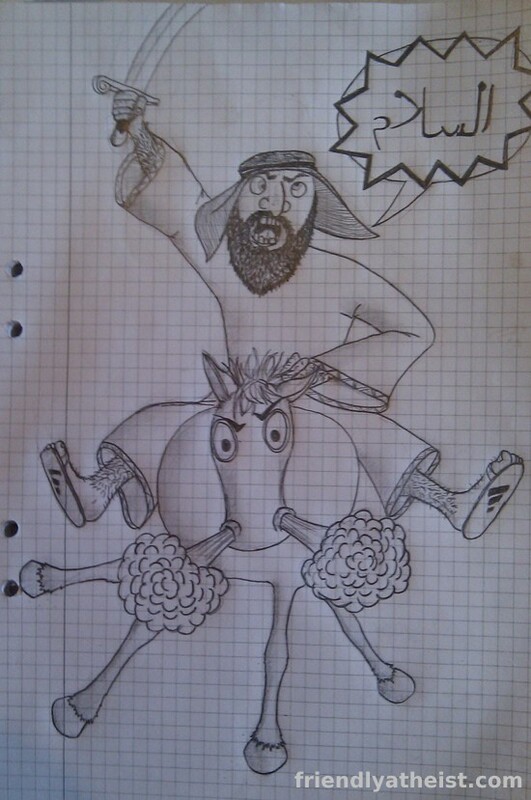 Flickr user "ribarnica" posted this drawing which includes portraits of the Flying Spaghetti Monster, Jesus, Moses and Betty White, in addition to Mohammed. 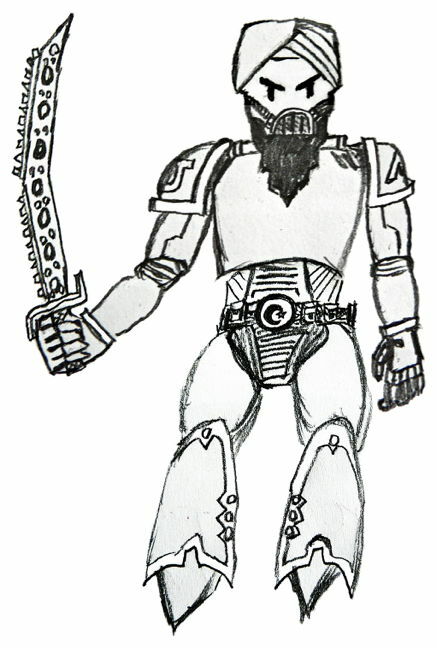 "pickmans_modell" posted this portrait of Mohammed as an "Ultra Marine" from the game "Warhammer 40,000." 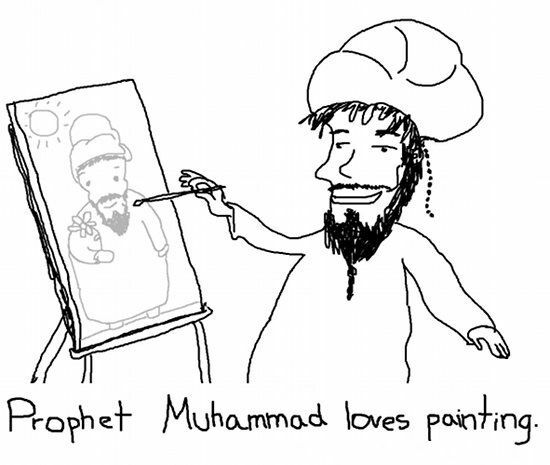 Unexpectedly, very few professional cartoonists and artists participated in Everybody Draw Mohammed Day. Their reasons for abstaining were outlined in this interesting May 20, 2010 "Comic Riffs" column in the Washington Post. 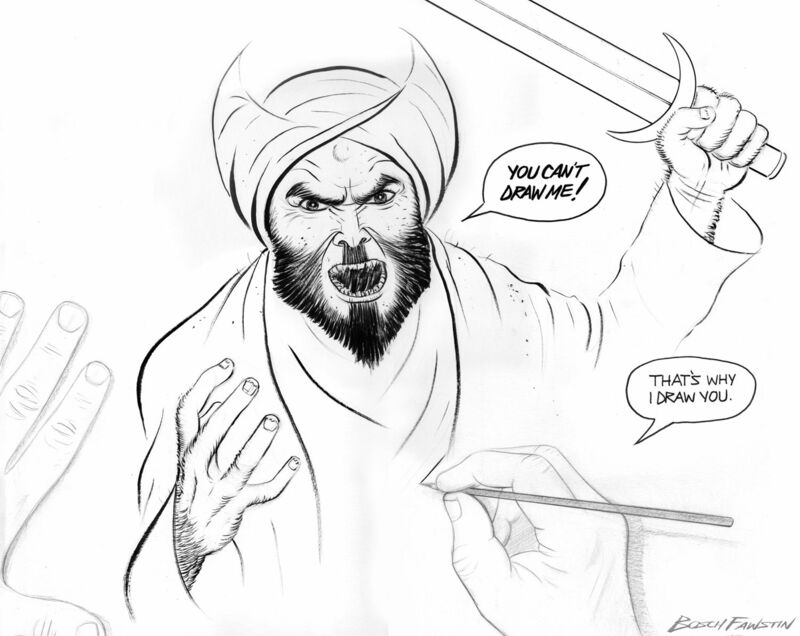 The majority of the highest-paid famous editorial cartoonists intentionally refrained from drawing Mohammed on that day, some saying that that they saw no need to unnecessarily offend Muslims, others saying that they don't like being told what to draw one way or the other, and others saying they didn't want their artwork to be hijacked for someone else's political agenda. 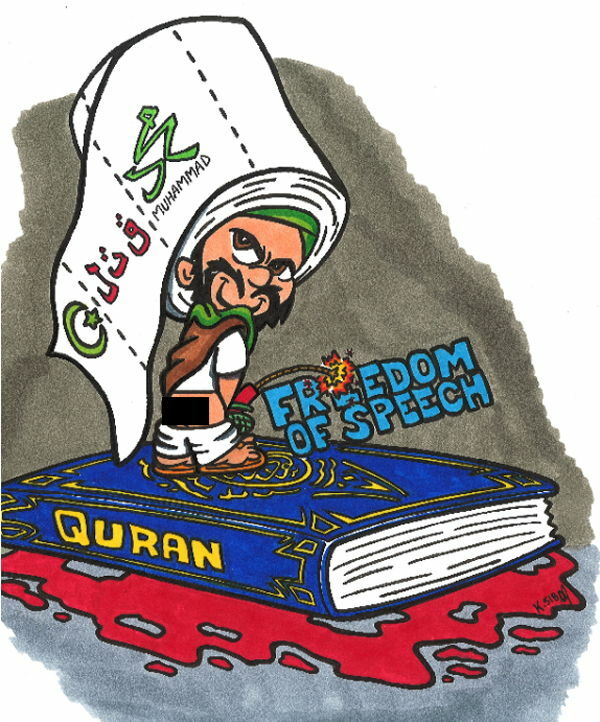 None admitted that they were simply too afraid of a violent backlash if they were to publish a Mohammed portrait in a major newspaper, but undoubtedly that fear was hiding behind many of their rationalizations. 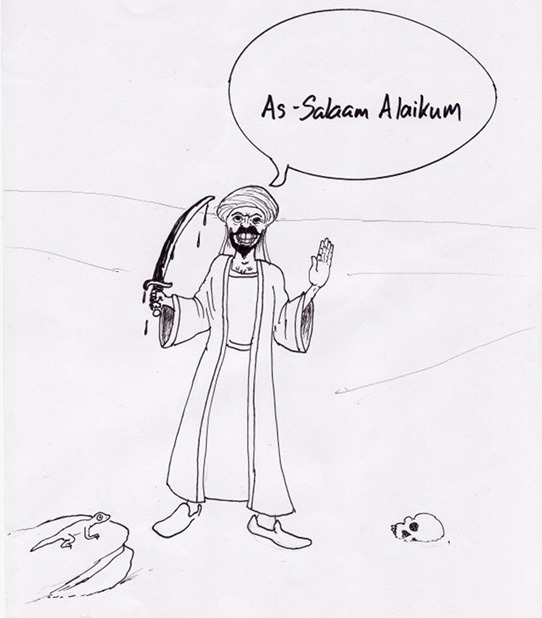 The only well-known surviving example of a professional cartoonist participating in Everybody Draw Mohammed Day was this cartoon by the South African cartoonist Jonathan Shapiro (a.k.a. 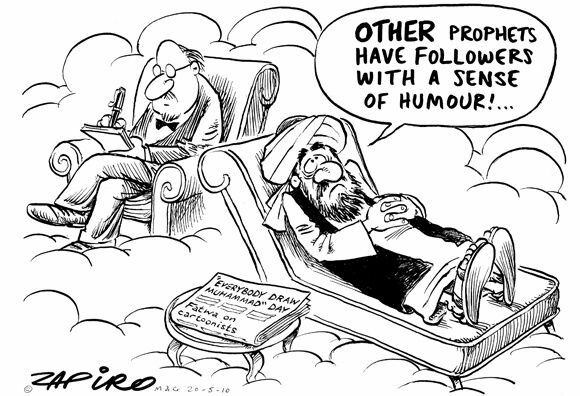 "Zapiro") in the Johannesburg Mail & Guardian; it sparked protests and threats of violence in the local Muslim communities when it was published on May 20, 2010. 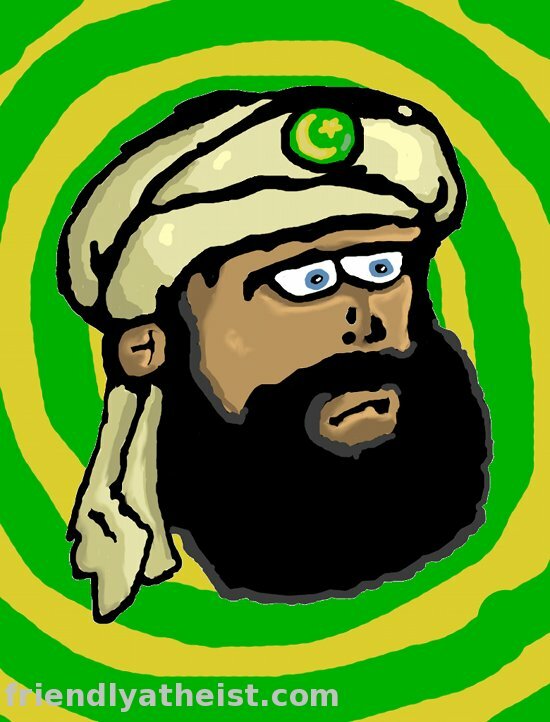 All types of independent, unaffiliated artists, bloggers, pundits, commenters and private individuals all over the world created their own contributions to Everybody Draw Mohammed Day and posted them to their own Web sites, blogs or social media accounts on or around May 20, 2010. The vast majority of these artworks were only ever viewed by the few fans or friends of each person, and were never included as part of any high-traffic contest or site, and are thus unknown to the world at large and are consequently hard to track down -- especially considering the ever-shifting ephemeral nature of the Internet, in which social media accounts and blogs frequently go defunct or are abandoned. 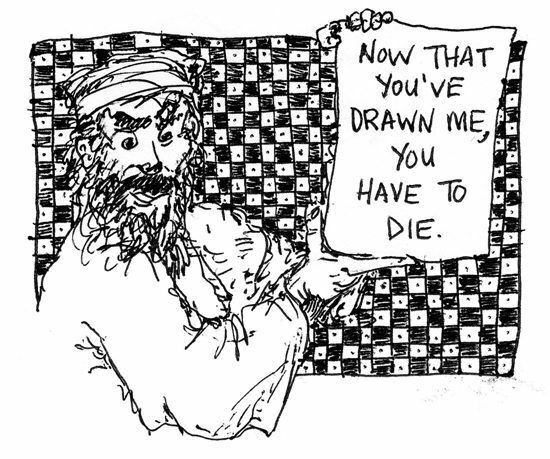 This section includes just a tiny sampling of these many independent submissions to Everybody Draw Mohammed Day, with the acknowledgement that thousands more were quickly created and then just as quickly fell into obscurity. 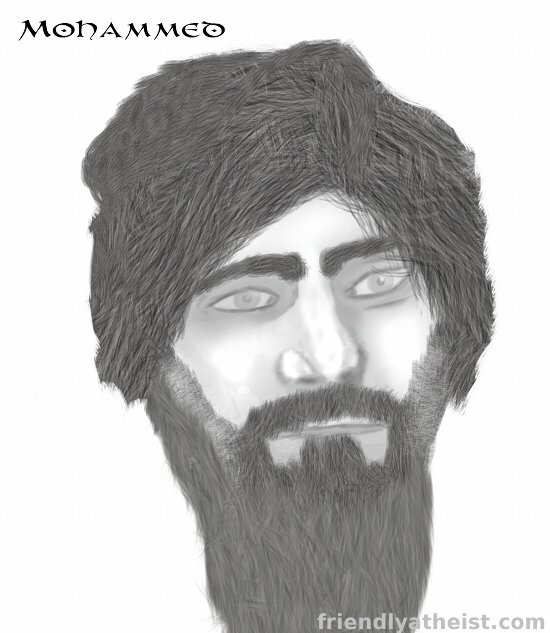 ...and then this more polished close-up of just his head. 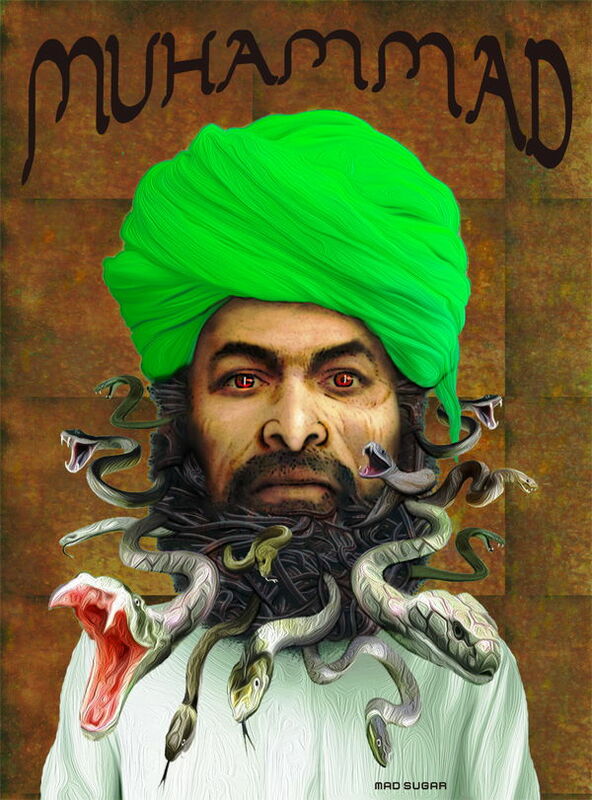 Five years later in 2015, Bosch Fawstin won the First Annual Muhammad Art Exhibit and Contest (see below) with yet a third, updated and more sophisticated rendering of a demonic Mohammed. 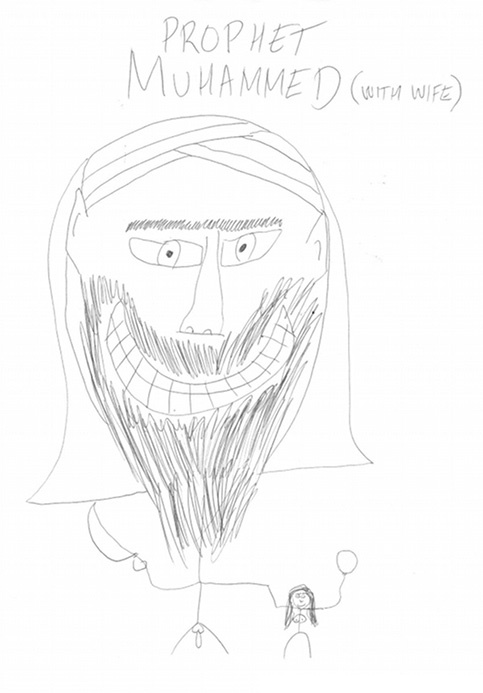 This collection of Mohammed portraits from the original 2010 Everybody Draw Mohammed Day is by no means comprehensive; additional noteworthy and significant portraits may be added to this page as they are brought to our attention. 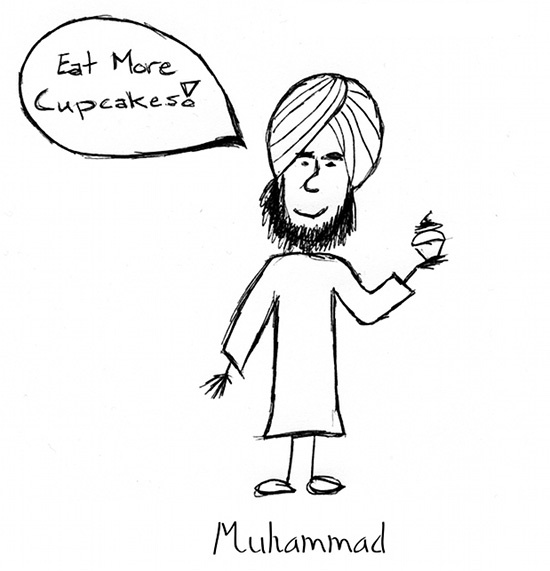 In the weeks leading up to the original Everybody Draw Mohammed Day, political satire site The People's Cube announced a rival celebration, "Everybody Draw a POSITIVE Mohammed Day," intended as a counterpoint to the expected deluge of insulting portraits being created for the main event. 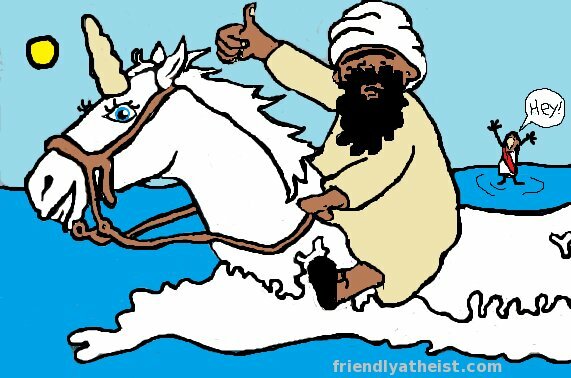 But Everybody Draw a POSITIVE Mohammed Day was subtly sarcastic: while the images made for it appeared on the surface to be respectful toward Mohammed himself, they often contained ironic critiques of Islam overall and/or of socialism (the usual target of mockery at The People's Cube). 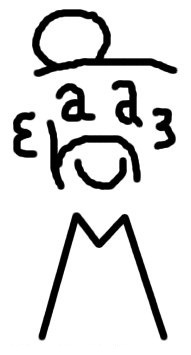 Below is a selection of original entries to Everybody Draw a POSITIVE Mohammed Day, excluding any portraits which either did not actually show Mohammed or which were primarily derivative (e.g. 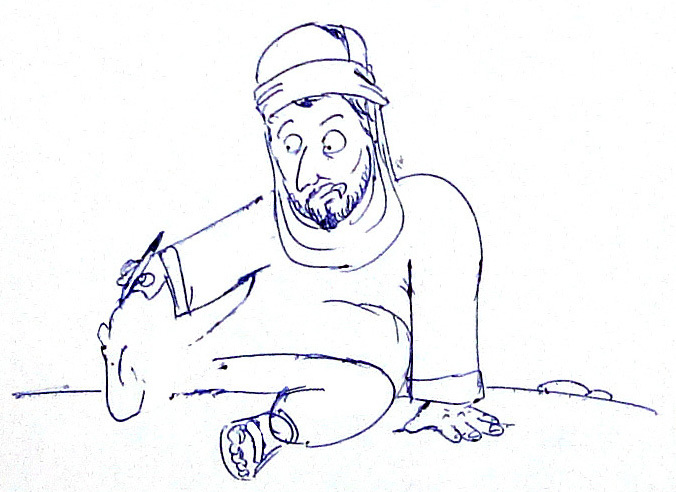 merely appending a new caption to a pre-existing well-known Mohammed portrait). 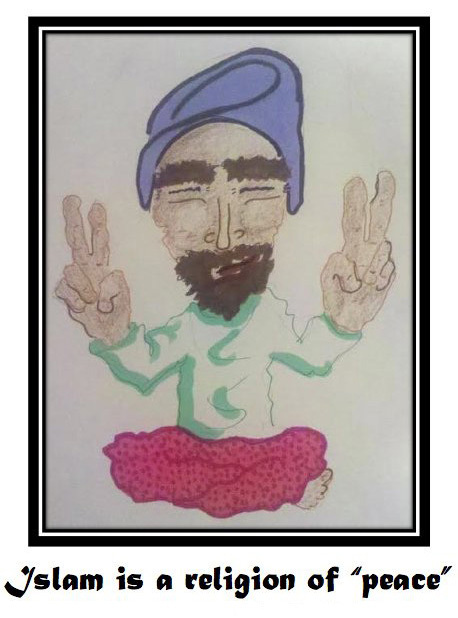 For the full selection of Everybody Draw a POSITIVE Mohammed Day submissions, see the original post at The People's Cube. 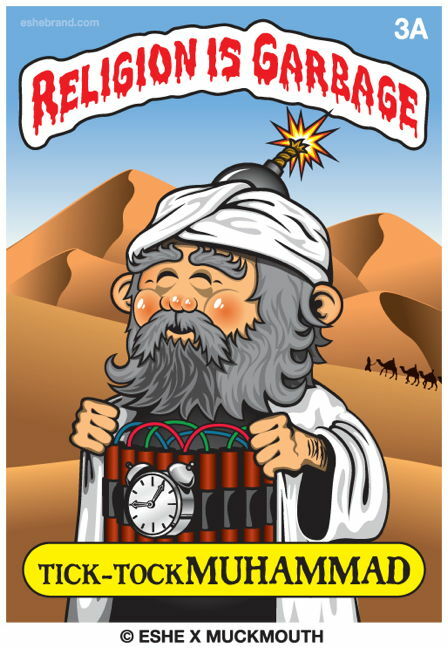 This entry, by People's Cube proprietor "Red Square," satirized the famous "Hope" poster from the 2008 Obama campaign, substituting Mohammed in Obama's place. 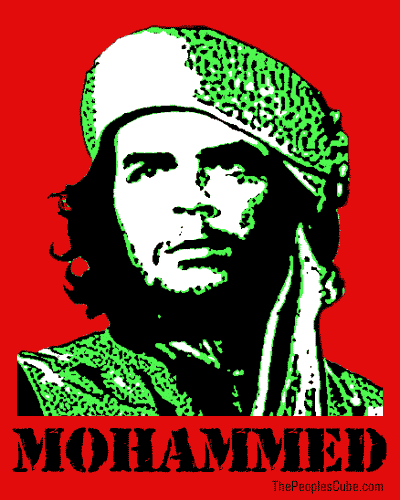 Similarly, this entry transformed Che Guevara's iconic image into Mohammed. 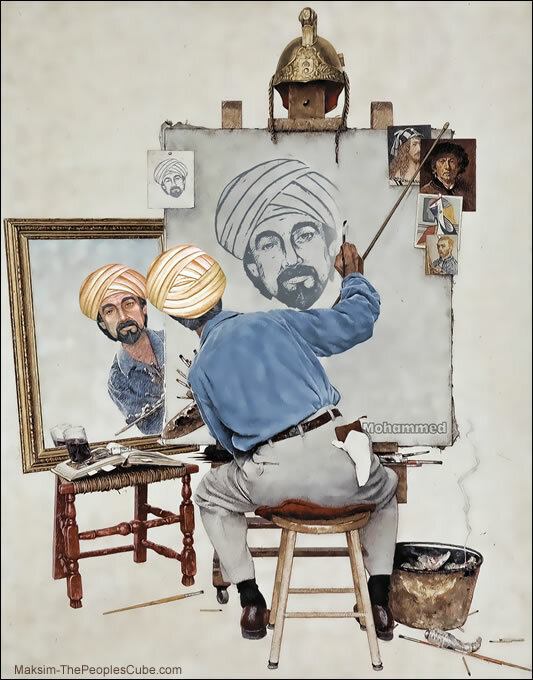 Continuing the theme, People's Cube "Superkommissar Maksim" fashioned this reworking of Norman Rockwell's famous self-portrait, which actually features four separate Mohammeds. 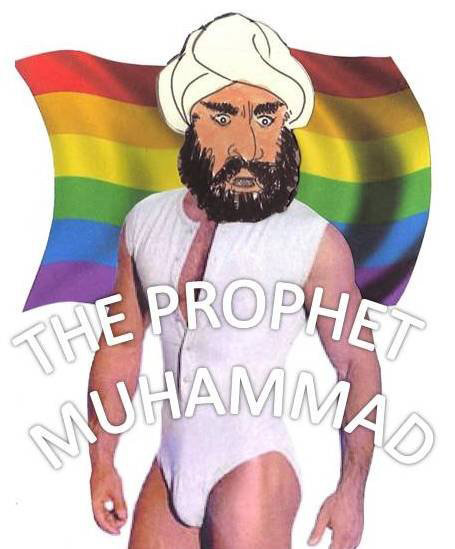 This particular Mohammed parody itself became its own meme, with several derivative versions of Maksim's creation surfacing every year around May 20. 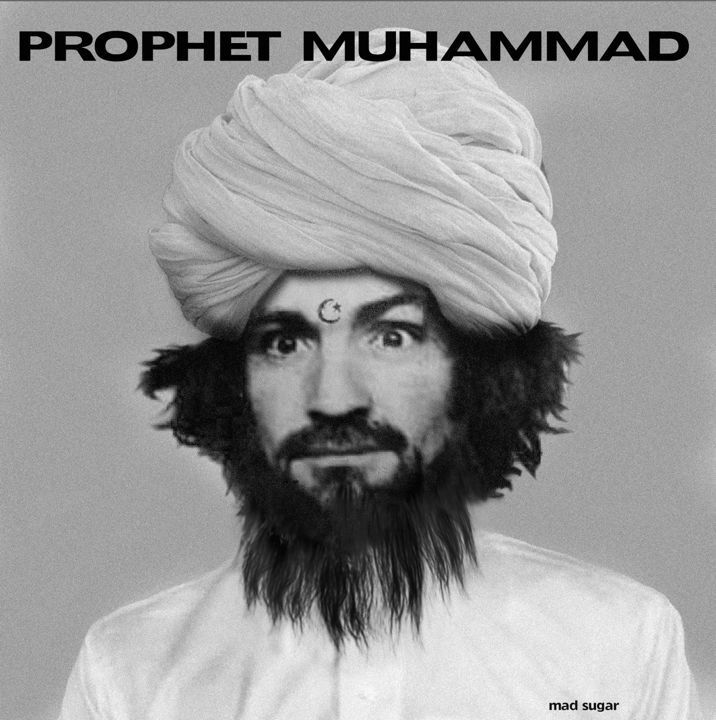 Furthermore, a copycat variant was used as the poster for the 2015 "First Annual Muhammad Art Exhibit and Contest." 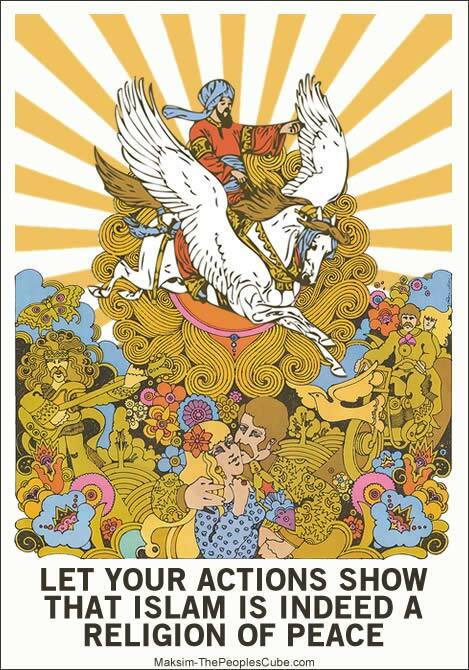 Superkommissar Maksim also transformed a 1960s Peter Max-style hippie poster into a message of peace for Muslims; Mohammed is seen riding Buraq at the top. 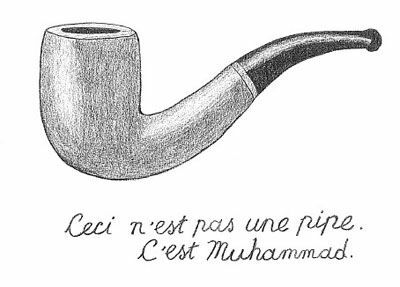 This parody of René Magritte's infamous "This Is Not a Pipe" painting is similar in concept to the entries in the Archive's "This Is Mohammed" section. 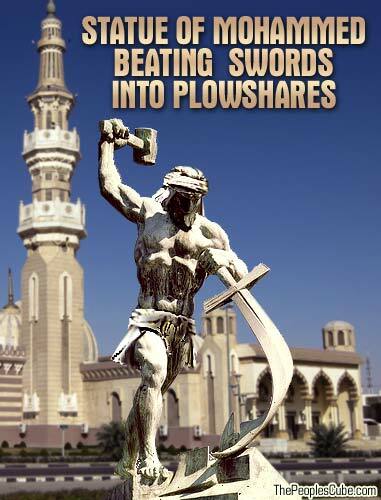 Parody of the Soviet statue titled "Let Us Beat Swords into Plowshares" displayed in front of the United Nations Building in New York City, here repositioned to be in front of a mosque. 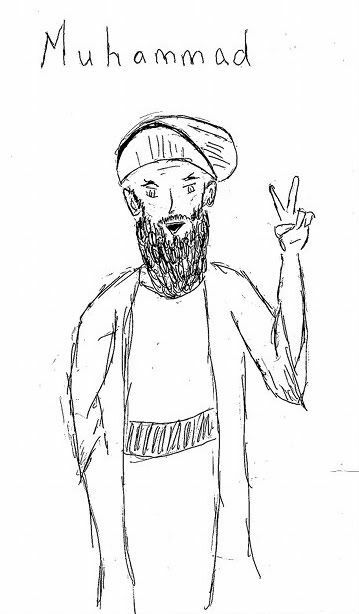 Although this was not an official "entrant" to Everybody Draw a POSITIVE Mohammed Day, the organizers included it in the gallery anyway because it was an example of life imitating art: a contributor to the left-wing activist site Firedoglake drew this unwittingly self-parodical version of Mohammed flashing a peace sign as their own "positive" contribution to Everybody Draw Mohammed Day, to counter what they considered was its antagonistic tone. 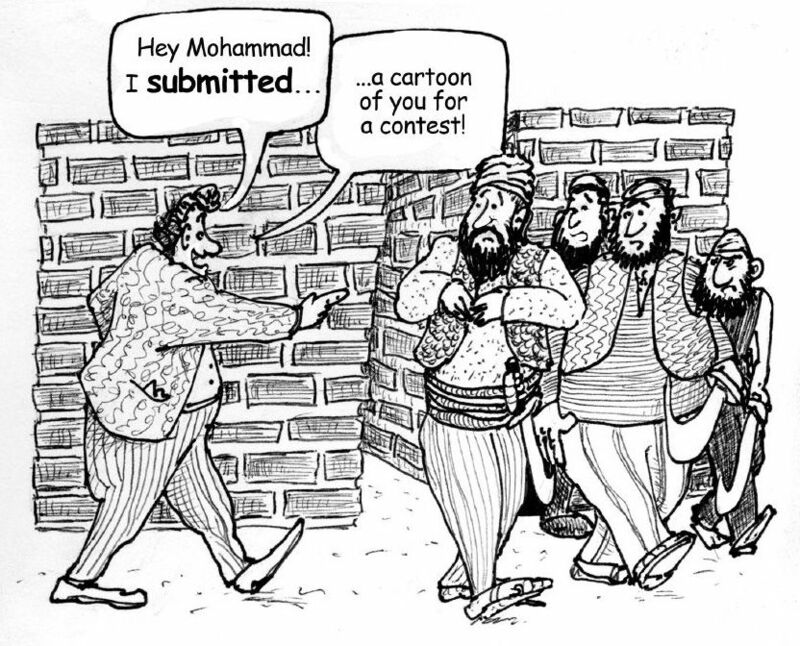 The First Annual Muhammad Art Exhibit and Contest was a highly publicized event in 2015 which started in February with a three-month-long online contest for the best (i.e. most humorous and politically incisive) Mohammed portraits, culminating with a real-world awards ceremony and art exhibit of the winning entrants, held in Garland, Texas on May 3, and sponsored by Pamela Geller's American Freedom Defense Initiative, Robert Spencer's Jihad Watch, and the David Horowitz Freedom Center. 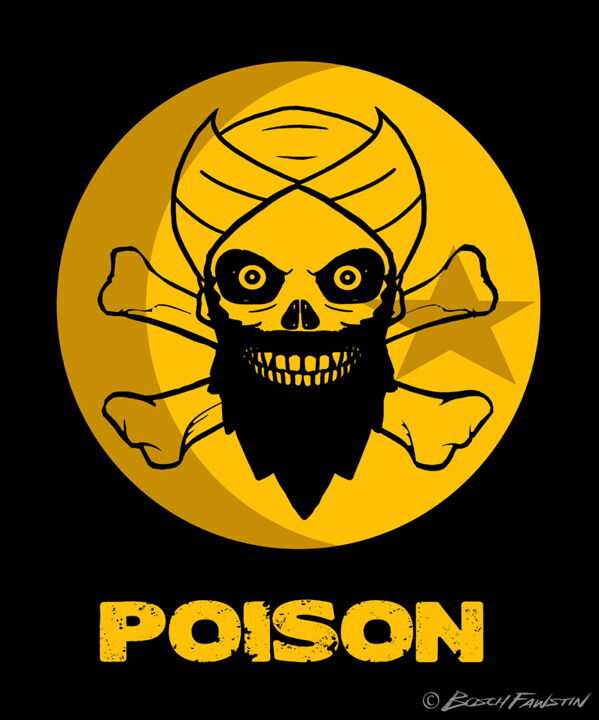 Everything went as planned, until midway through the awards ceremony, when two Muslim terrorists attacked the event; luckily they only managed to wound a guard before they were killed by police. But as a result, the mainstream media paid little attention to actual art exhibit and instead focused on the terror attack, so that (for example) the wikipedia entry about the event is called "Curtis Culwell Center attack" (so-named after the building where the attack happened) rather than being titled after the art exhibition itself. 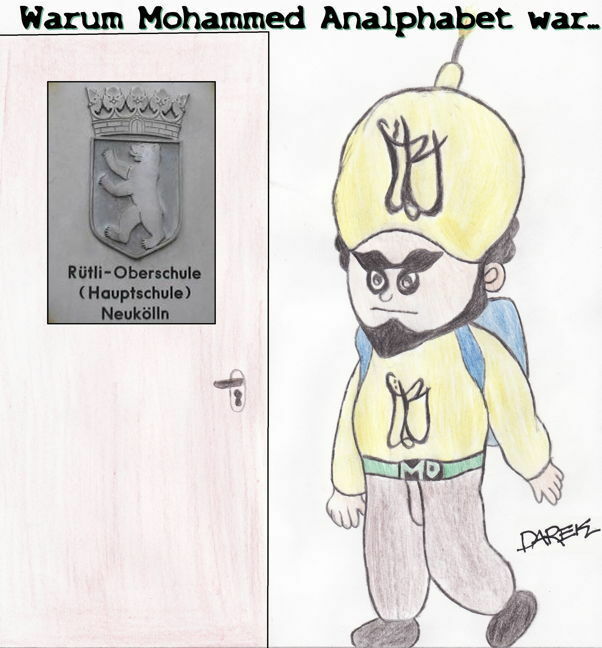 This entry is not about the terror attack (which received extensive coverage in the media), nor about the ceremony, but instead is solely about the Mohammed portraits created for the contest and exhibit. 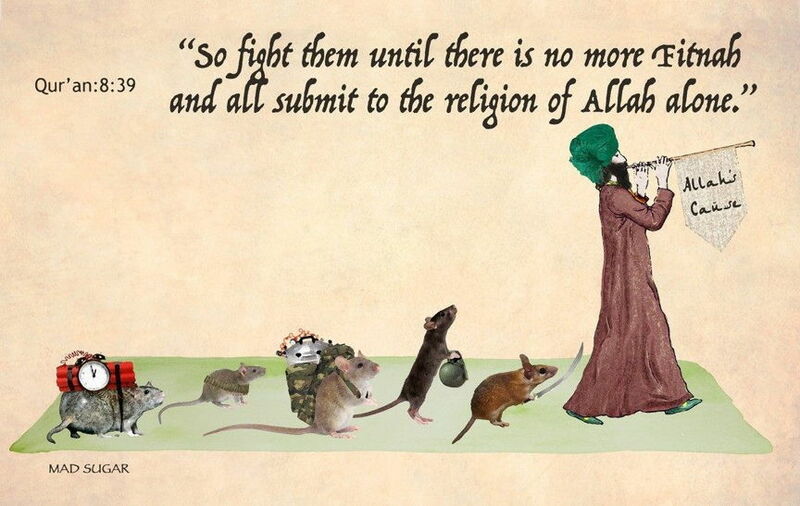 The contest was announced and publicized on conservative sites such as Breitbart.com and WorldNetDaily, and the official announcements about the contest were posted on Pamela Geller's site: a complete listing of her over 100 posts about the event and its aftermath can be viewed by searching for the "AFDI Muhammad Art Exhibit and Contest" tag and starting at the end of the list for the earliest posts, since the results are presented in reverse chronological order. Geller first announced the contest on February 2, 2015 (Click on image above to see larger version of the announcement poster), and declared the winner on April 17. Between those two dates there were dozens of posts and updates featuring numerous submissions among which readers could vote for their favorites. 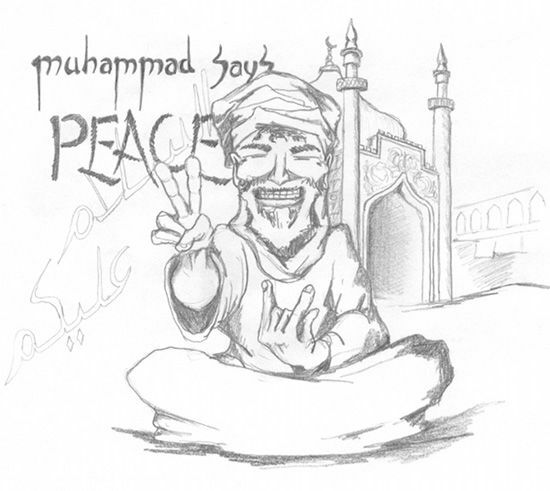 Below is an extensive selection of submissions to the First Annual Muhammad Art Exhibit and Contest, with the winner shown first, and many other entries following it. 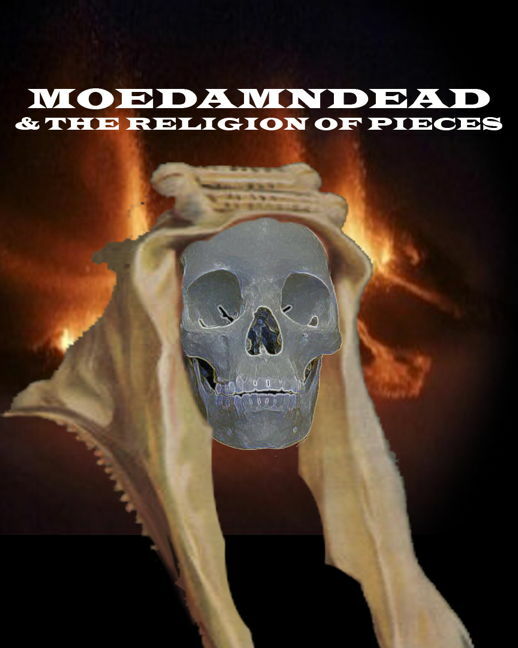 Space considerations prevent this page from hosting the complete collection of all 350 submissions; instead, the Archive primarily features here submitted entries which contain original artwork, as opposed to deriviative photoshops or collages which merely re-used pre-existing Mohammed portraits. 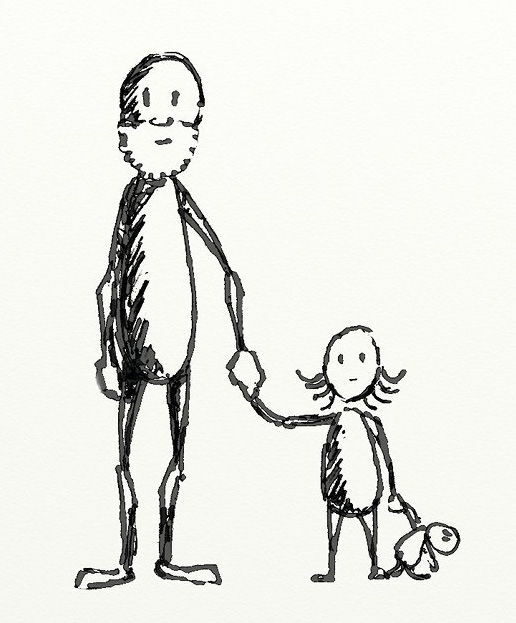 The sample entries below were sourced at the contest's official archives. The organizers had originally uploaded all the submissions to this Photobucket library, but it has since been deleted, and the only remaining exemplars from the contest are the submissions included in various blog posts and press releases encourging readers to vote for their favorites. 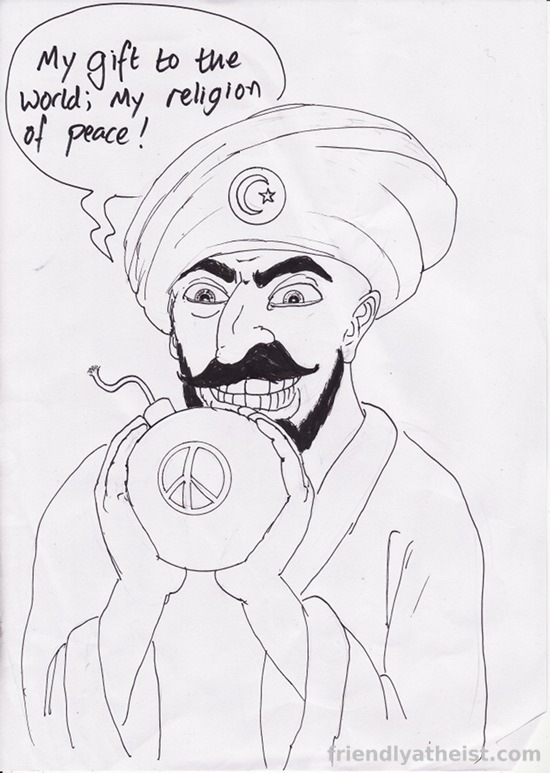 In early August of 2006, at a youth summer camp for the anti-immigrant Danish People's Party (DPP, or Dansk Folkeparti in Danish), drunken revelers staged an impromptu Mohammed cartoon-drawing contest, as a satire of the Mohammed cartoon contest sponsored by the Danish newspaper Jyllands-Posten several months earlier. Left-wing Danish activist Martin Rosengaard Knudsen, who had infiltrated the DPP in order to gather evidence of what he felt was the party's "extremist" beliefs, surreptitiously videotaped the contest and gave the tape to a Danish television station, which broadcast it; portions of the video were subsequently broadcast on Al-Jazeera as well. Knudsen spent 18 months masquerading as a DPP member in the hopes of secretly filming some evidence of the party's extremism, and this video was the most damning incident he encountered. A 4-minute version of Knudsen's secret video can be viewed here at YouTube. The screenshots shown on this page are taken from the film, which unfortunately is low-resolution. 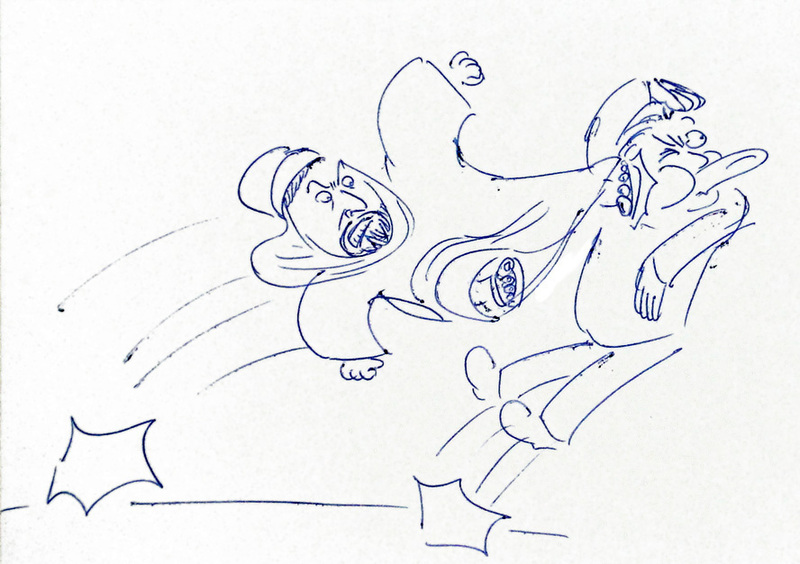 Only two of the Mohammed portraits from the contest are ever shown clearly in the video. 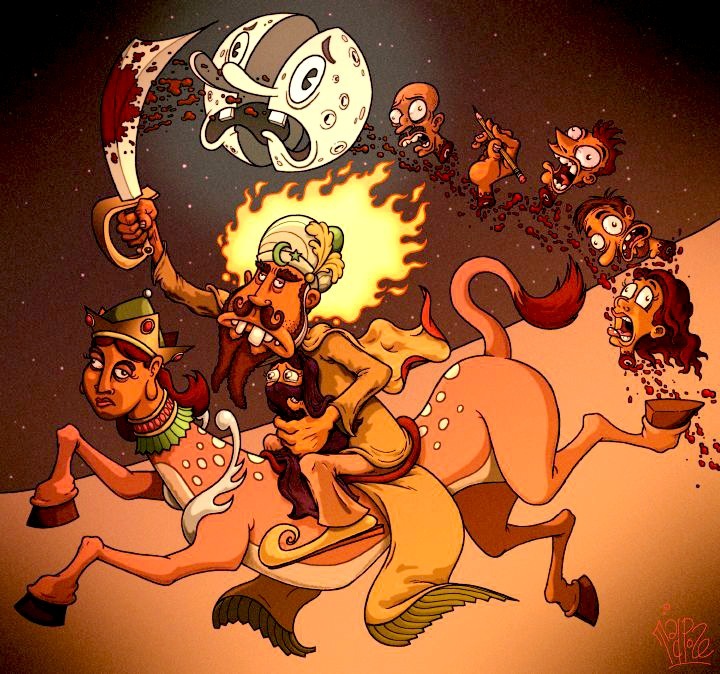 The first one, shown in the first screenshot above, depicts Mohammed as a urinating (or defecating) allegorical camel with Carlsberg beer bottles for humps. 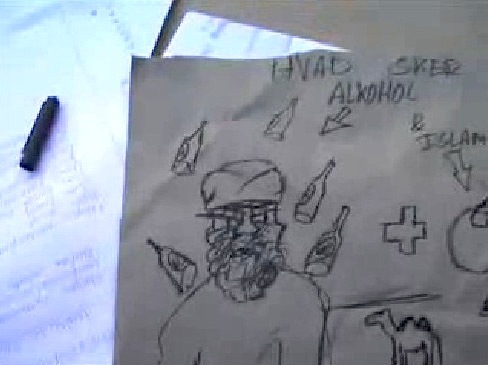 The drawing is held up by a Danish People's Party "youth member" during the judging portion of the contest. 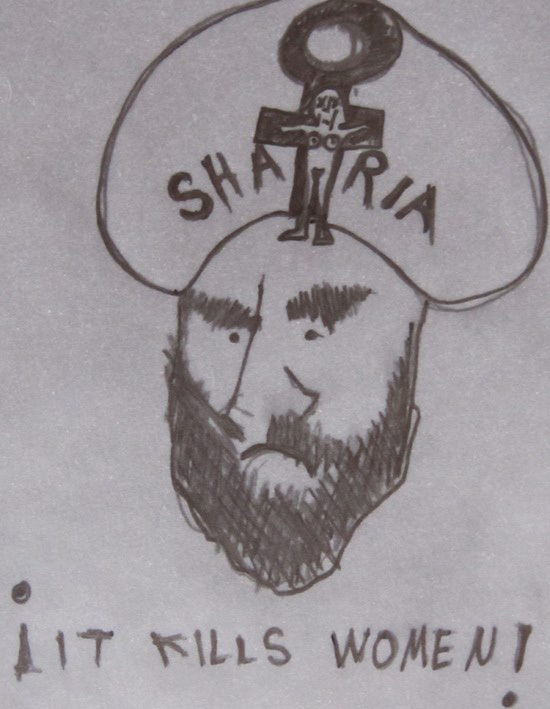 The second drawing, shown twice here -- first in the process of being created by an inebriated partier, and then in its completed version -- shows Mohammed as a drunkard surrounded by more beer bottles. 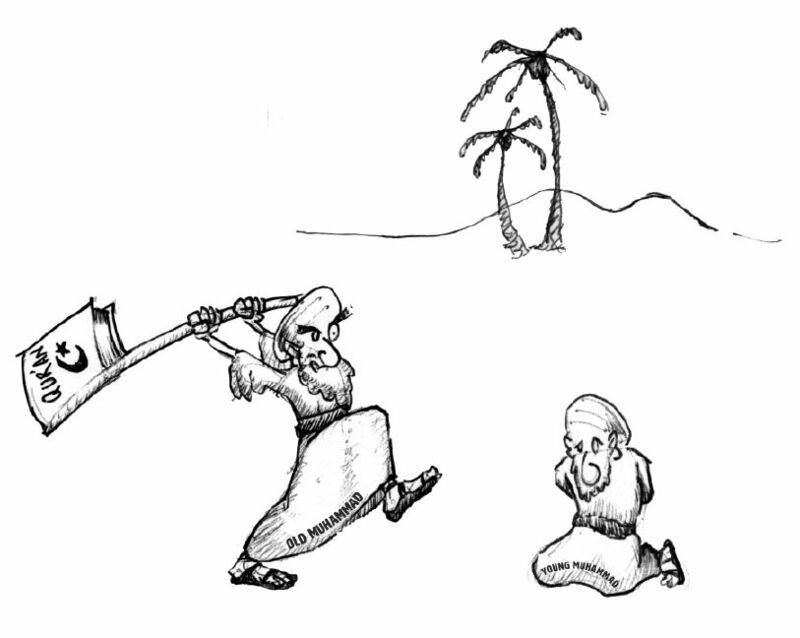 (The participants seemed to be as obsessed with beer as they were with Mohammed.) 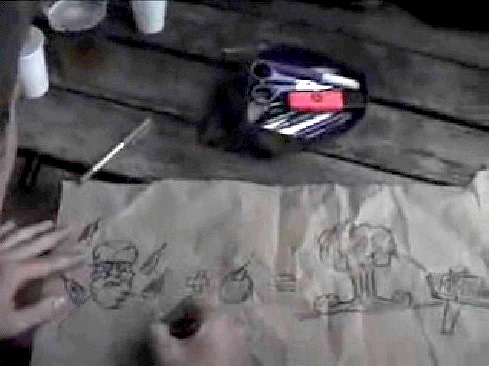 There were dozens of other sketches created by the contestants, but none of them are clearly displayed in the poor-quality video. The incident received extensive publicity at the time, but subsquently almost all mention of it has been scrubbed from the Internet, and most blog posts and news articles about the contest are no longer online. The information in the following paragraph was taken from a variety of sources, mostly now vanished. Although the contest was nothing more than a drinking party game, the tape of the raucous evening caused a minor scandal in Denmark, where the DPP had been growing in popularity. 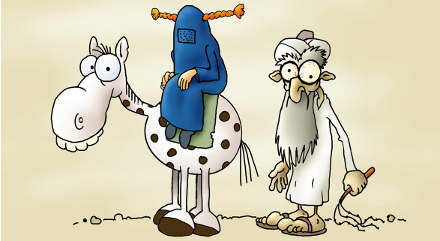 On October 8, 2006, the scandal over the drunken cartoon-drawing contest went international when the President of Iran and the Prime Minister of Denmark both strongly condemned the incident, with Ahmadinejad saying of the amateur cartoonists, "Those who make these insults are low life, lost, without human values." The government of Iran berated the Danish envoy over the drinking game, comparing it to the Holocaust. The International Herald Tribune reported that two of the people shown in these videos went into hiding to avoid reprisals from Muslim extremists, and in late 2006 the Danish government warned its citizens not to travel to Muslim countries due to fears of a backlash over the contest. Muslims in Denmark itself, however, mostly decided to ignore it. The tape -- originally in ten short segments -- was also posted to YouTube at the time, but all the original uploads were subsequently taken offline once they began receiving publicity and complaints; the version currently visible here at YouTube contains the three most interesting segments together as a single complete video. 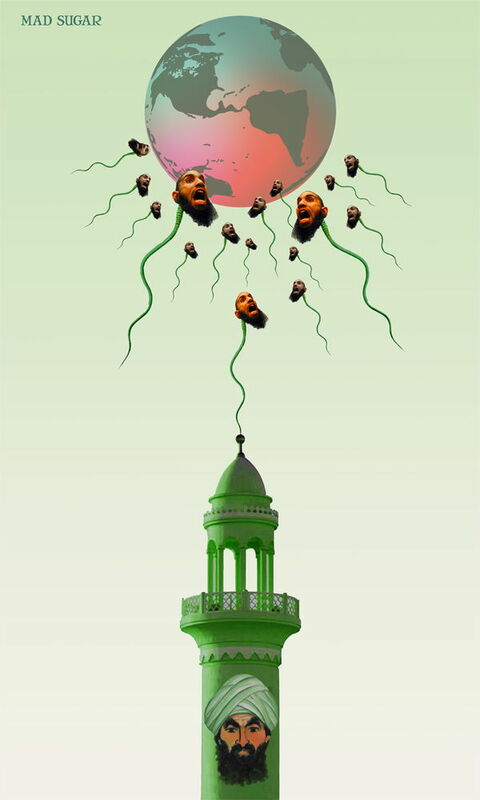 This competition -- scheduled to coincide with Everybody Draw Mohammed Day, but organized as a distinctively separate event with its own cash prize -- was announced in May 2010 by Stopp Islamiseringen av Norge (SIAN), which in English means Stop Islamisation of Norway, a Norwegian political movement opposed to open immigration from Muslim countries. 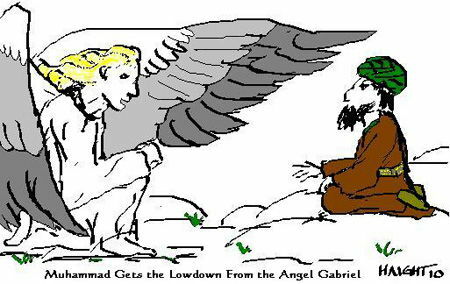 They offered a prize of 1000 Norwegian kroner (about $125 US) to the drawing which best characterized Mohammed's true nature. 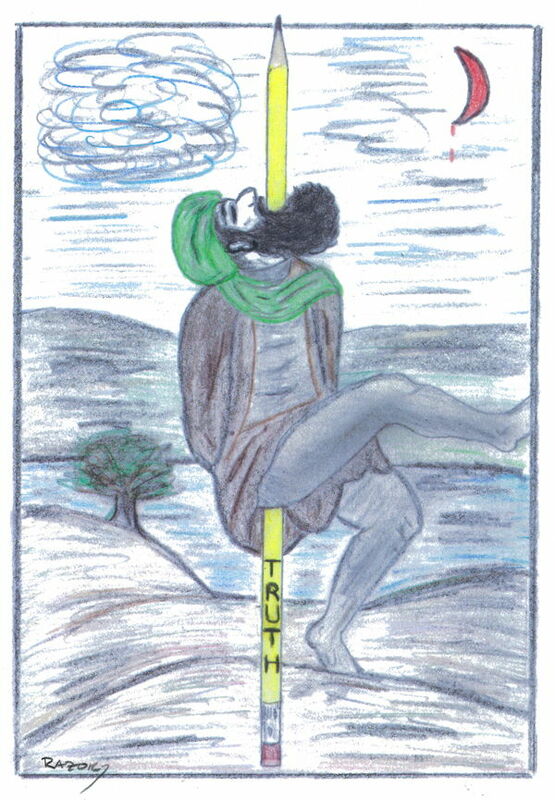 The winning drawing, shown here and announced in this June 2, 2010 post on the SIAN Web site, depicts Mohammed squatting atop a mountain of skulls after massacring the Jews of Medina in 627 AD, stealing their treaure and enslaving their women. 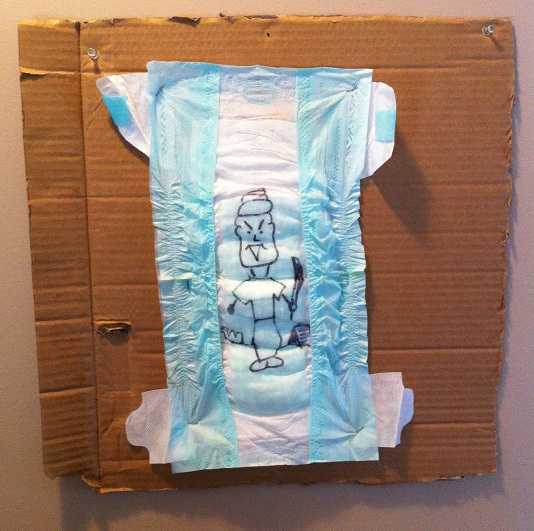 For his own safety, the artist has remained anonymous. 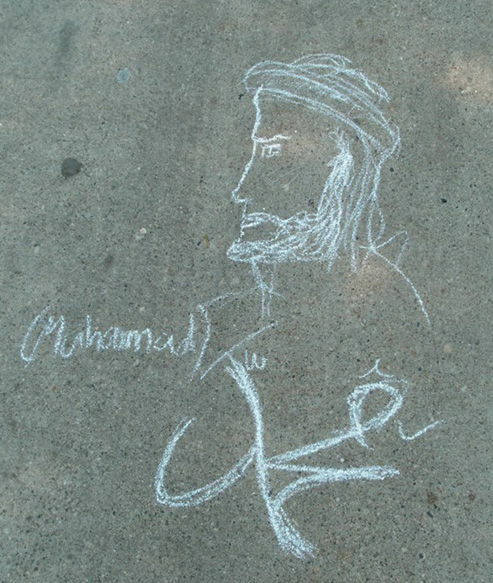 Although Everybody Draw Mohammed Day was never an "official" event, and although it was originally intended to only ever happen once (on May 20, 2010), over the subsequent years May 20 has organically evolved to become an annual folk holiday on which people draw portraits of Mohammed to affirm their right of unrestricted freedom of speech. 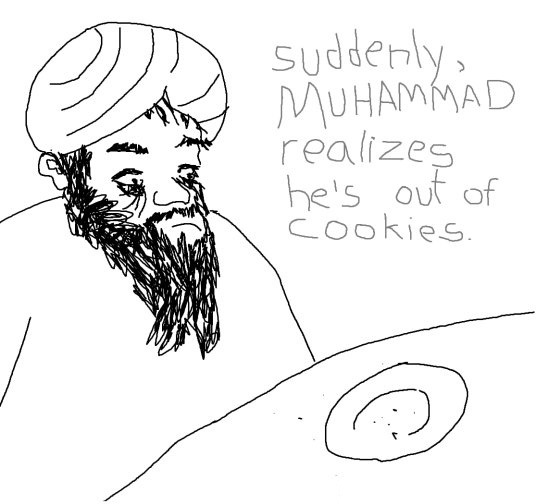 Its evolution into an annual holiday only became apparent on May 20, 2011 when, without any official announcement or central organizer, people all over the Internet began referring to the day as the Second Annual Everybody Draw Mohammed Day, and for the second time hundreds (or, more likely, thousands) of Mohammed portraits were posted online. 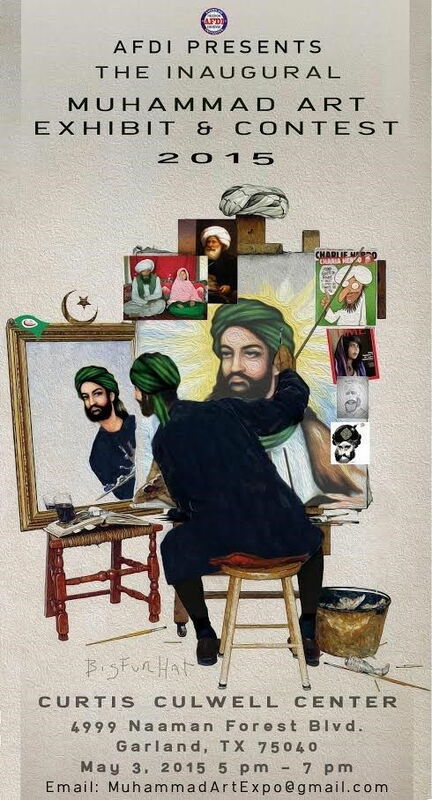 Because there was no central respository of these new portraits, and because most of the submissions were posted on blogs or social media accounts with only small numbers of visitors, it was very difficult for the average person to see most of the Mohammed portraits, as they were scattered in every corner of the Internet. 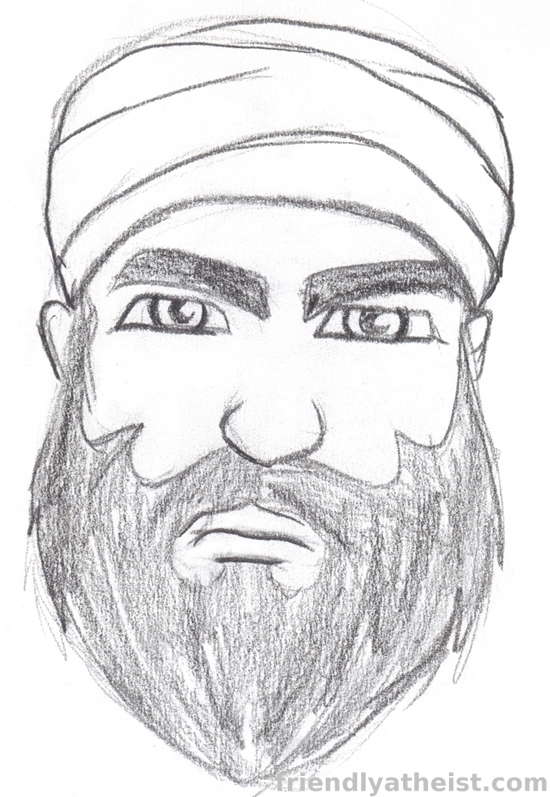 As also happened in 2010, the Friendly Atheist blog at the religion site Patheos.com assembled a wide-ranging compilation of portraits for the second unofficial Everybody Draw Mohammed Day, on May 20, 2011. An extensive selection from their compilation (focusing on original artwork) is presented below without captions; click the link above to see the full collection. 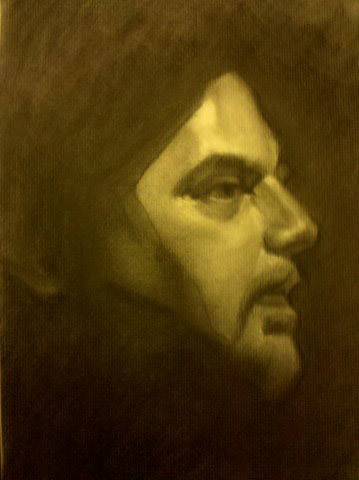 As also happened in 2010, almost all the blogs/sites on which the portraits were originally posted have in the interim gone offline, so the Friendly Atheist compilation rescued them for posterity. 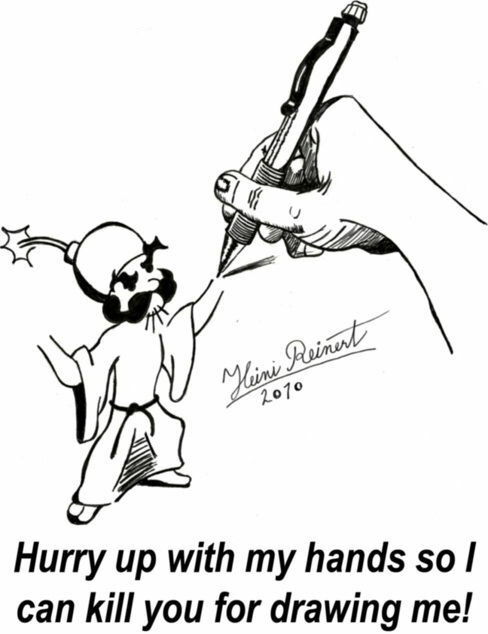 The date May 20 has by now become an annual "Draw Mohammed" holiday, with a disparate and ever-changing array of Web sites across the Internet marking the day each year with their own mini-celebrations and contests. 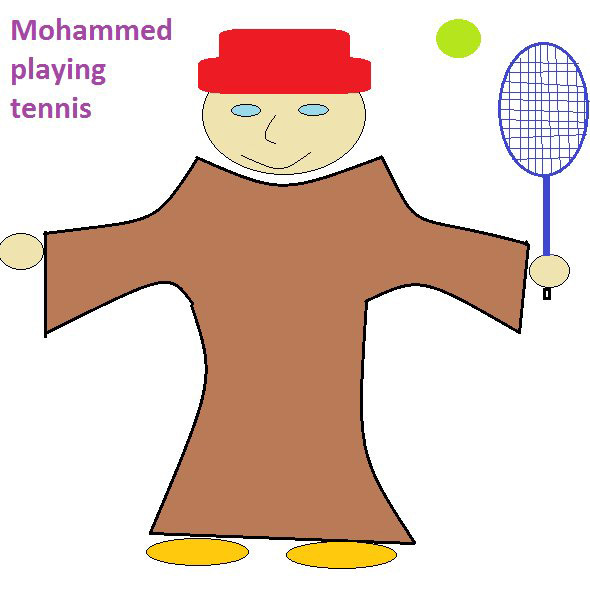 However, with each passing year, more and more Mohammed portraits from previous Draw Mohammed days get recycled and re-posted, such that by now it has become nearly impossible to know for sure whether any uploaded Mohammed is a "new" portrait created for that particular year's celebration, or is an "old" re-used portrait from a previous year. 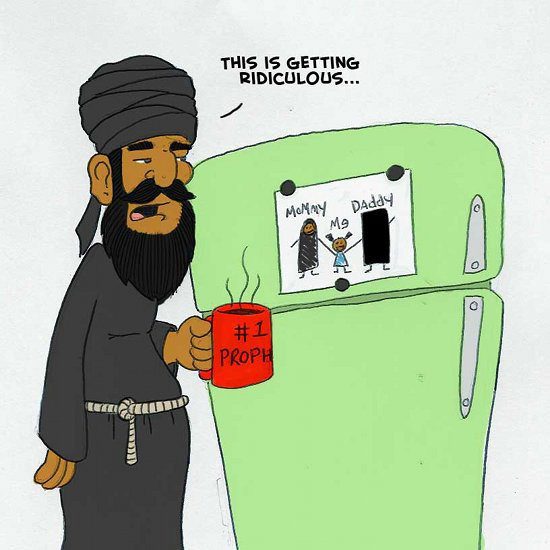 Because of this, the Archive (for now, at least) will refrain from identifying any Mohammed as definitely being from any specific recent Everybody Draw Mohammed Day, and will merely note that such days are celebrated every year with a fresh crop of Mohammeds. 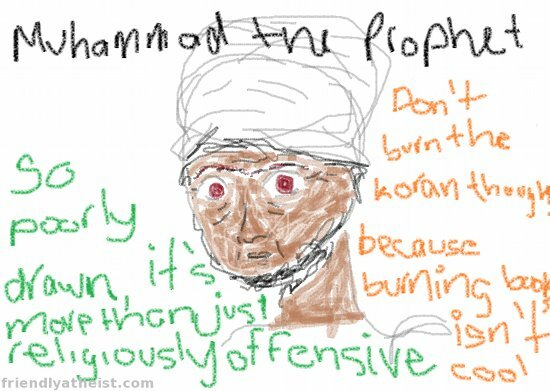 If any significant collections or posts from subsequent Everybody Draw Mohammed Days are brought to our attention and can be verified as original, we will eventually include them here.